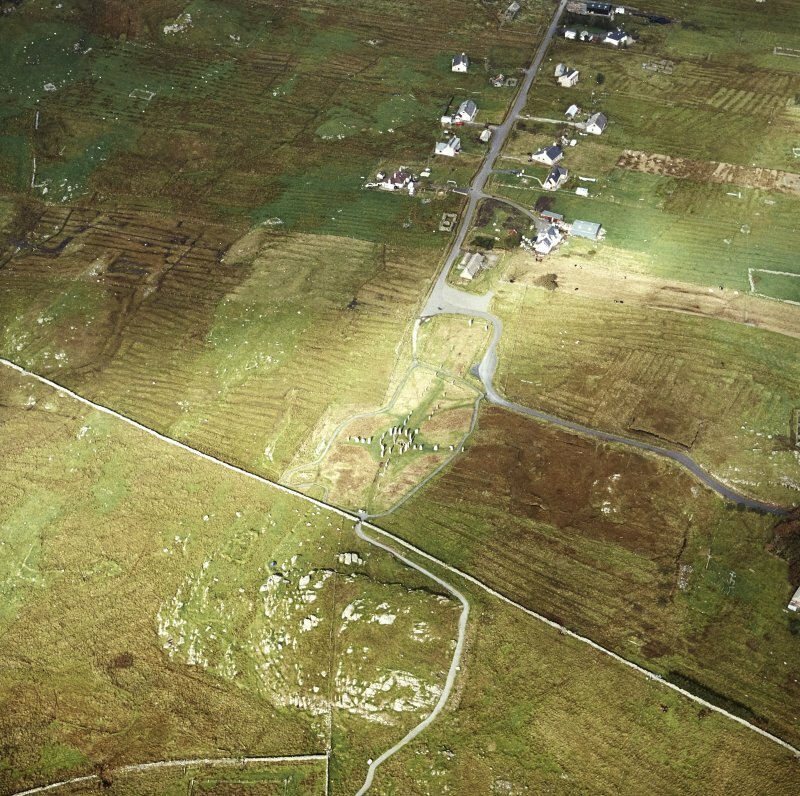 Oblique aerial view centred on the remains of the stone circle, chambered cairn and stone alignments with the township and lazy beds adjacent, taken from the SE. 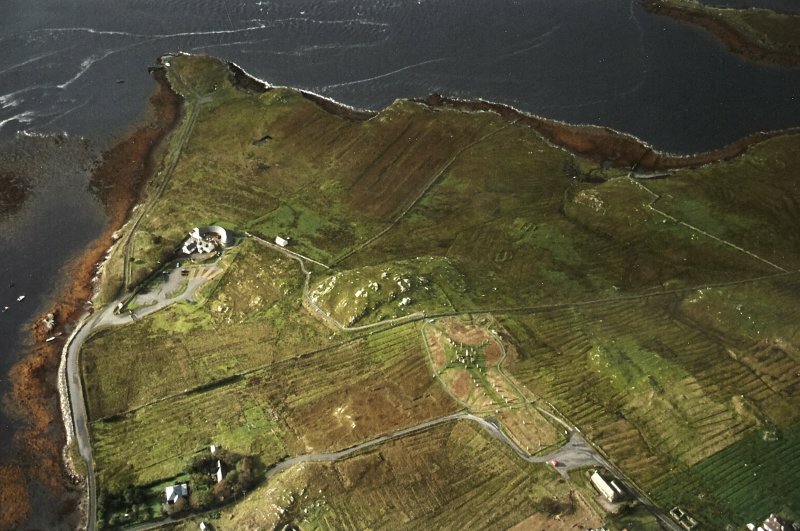 Oblique aerial view centred on the remains of the stone circle, chambered cairn and stone alignments with the township and lazy beds adjacent, taken from the WSW. General oblique aerial view looking across the remains of the stone circle, stone alignments and township, taken from the SW.
Oblique aerial view centred on the remains of the stone circle and stone alignments with the township and lazy beds adjacent, taken from the W.
Oblique aerial view centred on the remains of the stone circle and stone alignments with the township and lazy beds adjacent, taken from the SSE. 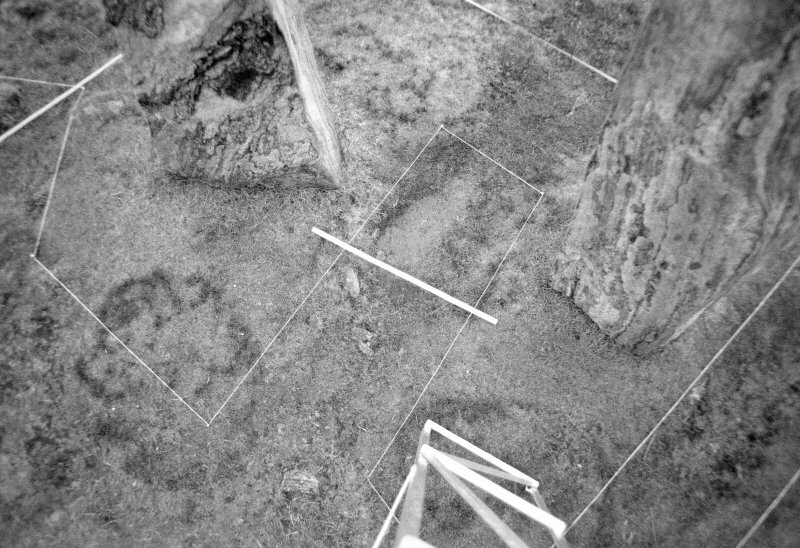 Oblique aerial view centred on the remains of the stone circle, stone alignments and chambered cairn, taken from the SSW. 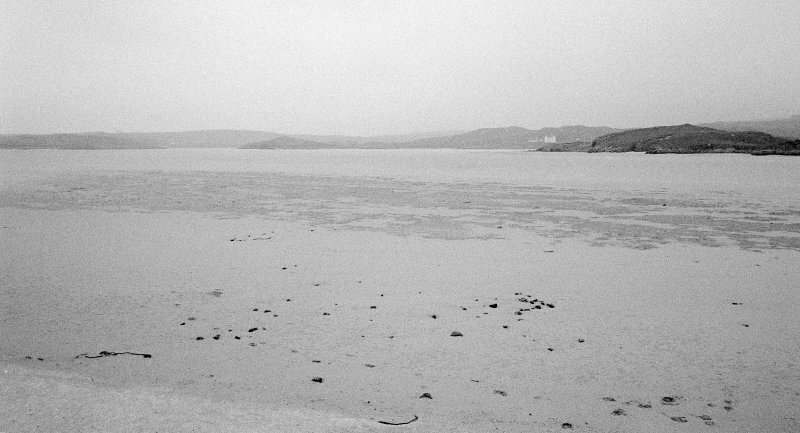 'Druidical circle, Callernish, Island of Lewis'. PSAS vol.2, plate XII. 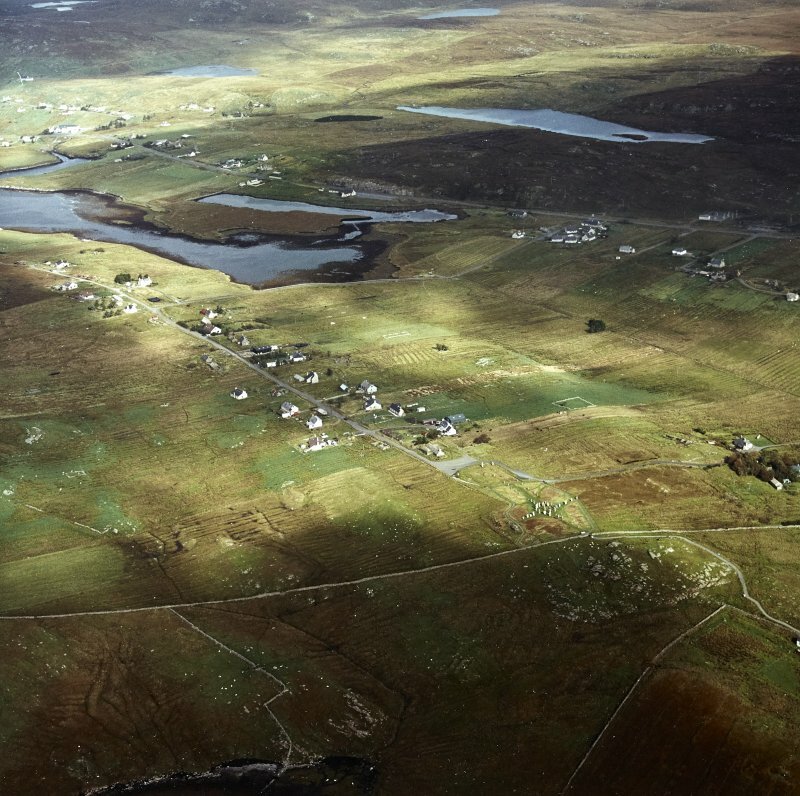 Oblique aerial view of Callanish stone circle and stone row, Lewis and the surrounding landscape. 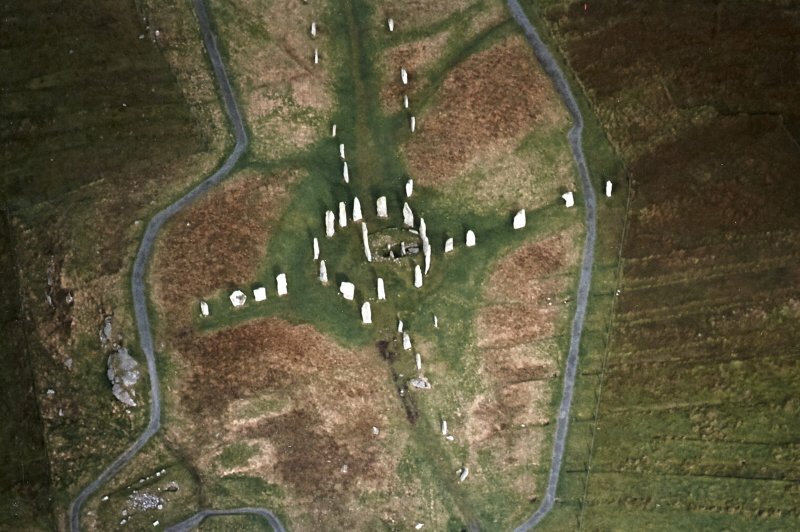 Oblique aerial view of Callanish stone circle and stone row, Lewis. 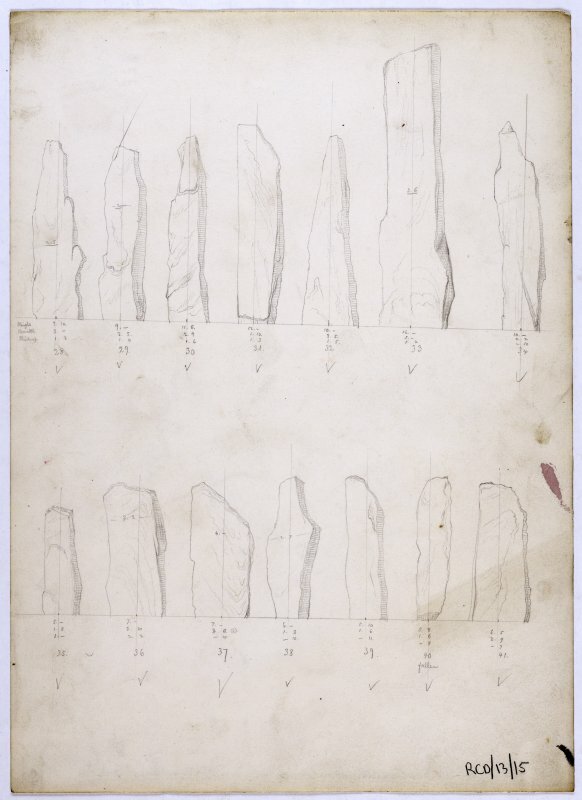 'Profiles of Callernish Stones by Mr H Sharbau'. 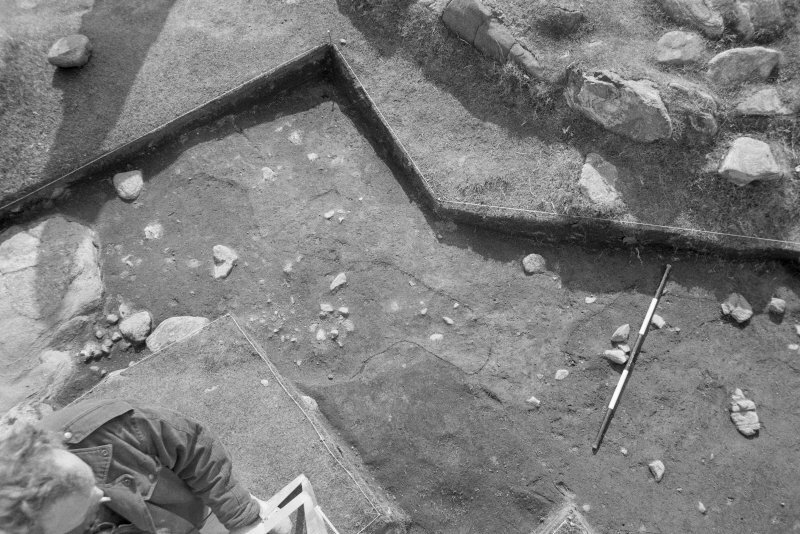 Oblique aerial view centred on the stone circle and stone row, the remains of the buildings and lazy beds at Calanais, taken from the E.
View of excavation at Callanish. 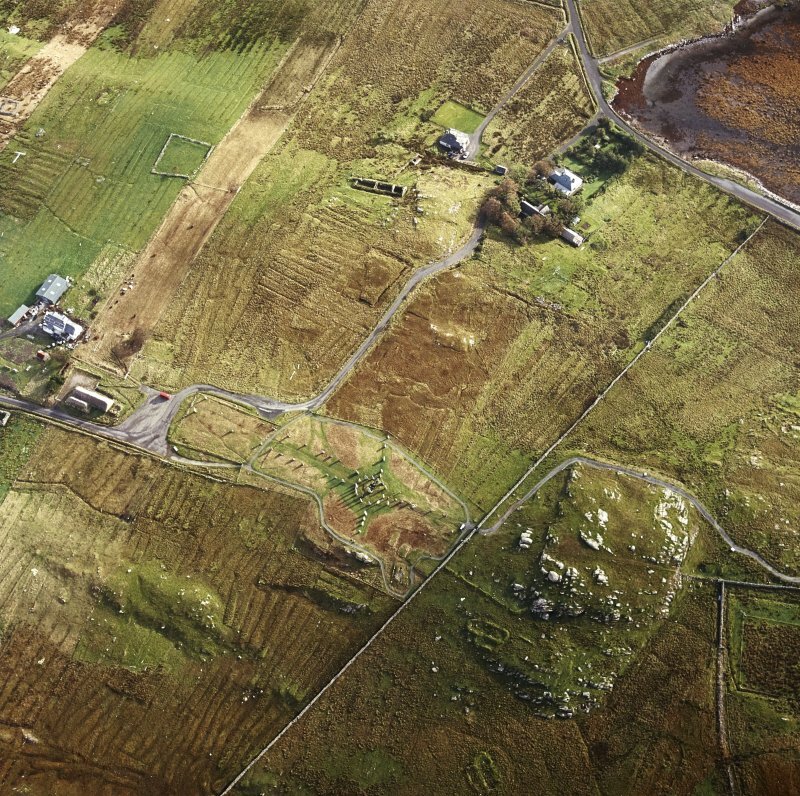 General oblique aerial view centred on the remains of the stone circle, chambered cairn and stone alignments with the farmhouse, visitor centre and township adjacent, taken from the ESE. 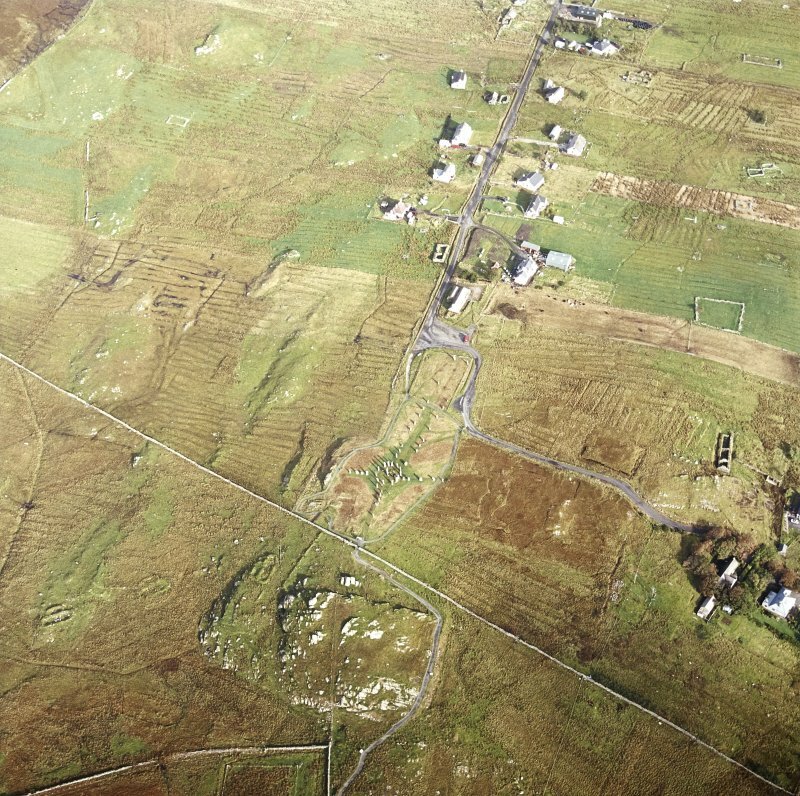 Oblique aerial view centred on the remains of the stone circle, stone alignments and chambered cairn with the remains of the township and lazy beds adjacent, taken from the NE. 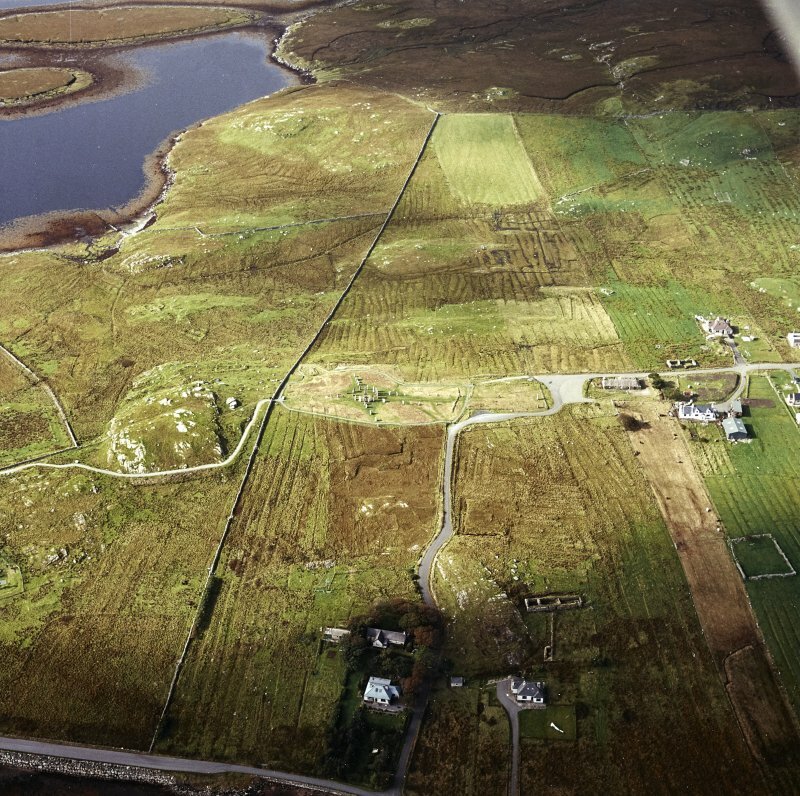 Oblique aerial view centred on the remains of the stone circle, stone alignments and chambered cairn, taken from the ESE. 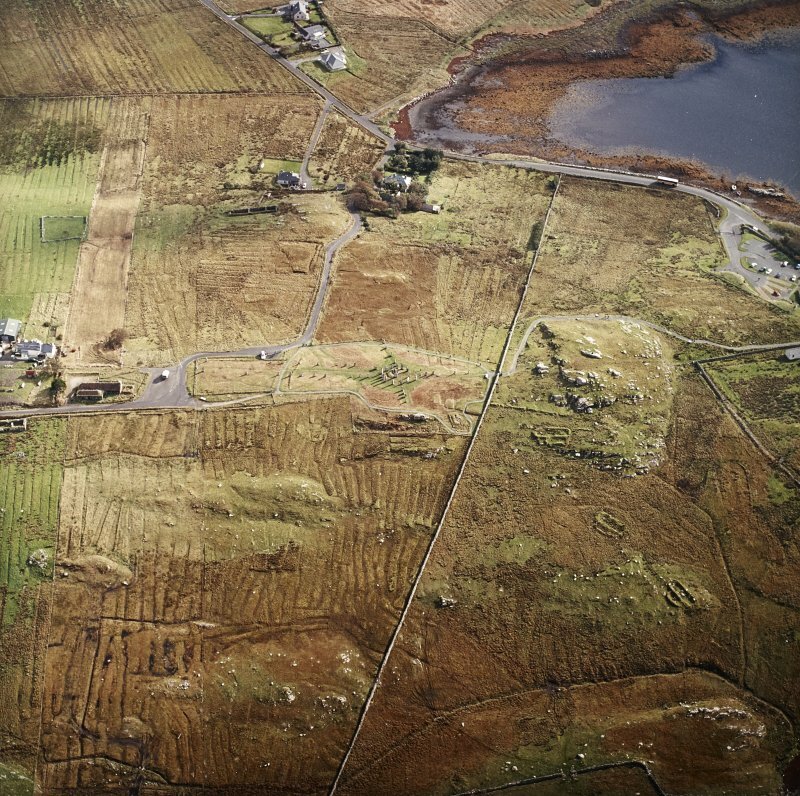 Oblique aerial view centred on the remains of the stone circle, stone alignments and chambered cairn, taken from the SE. 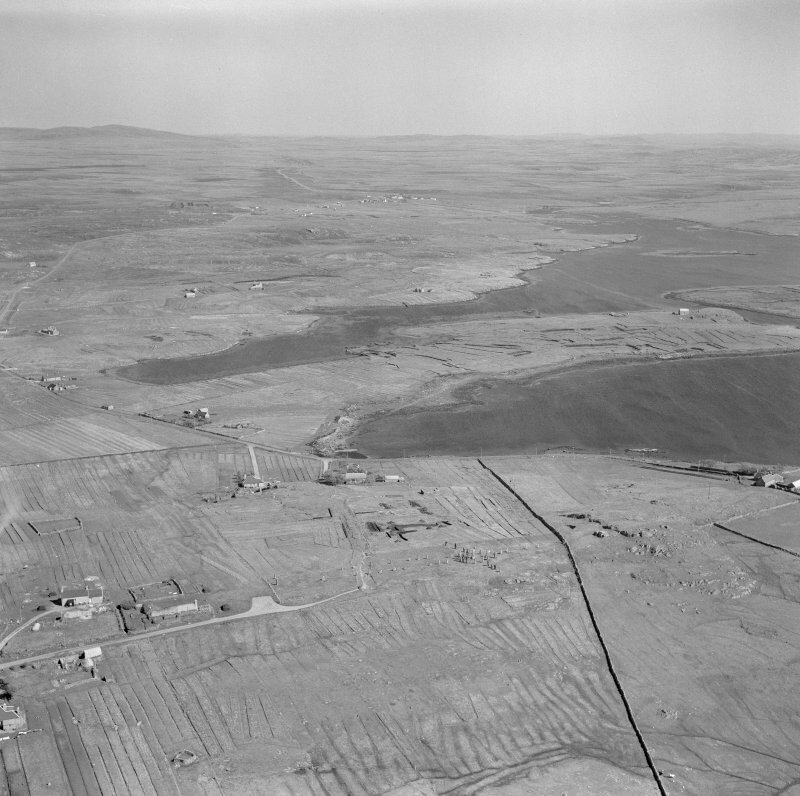 General oblique aerial view looking across the remains of the stone circle, stone alignments and township, taken from the SE. 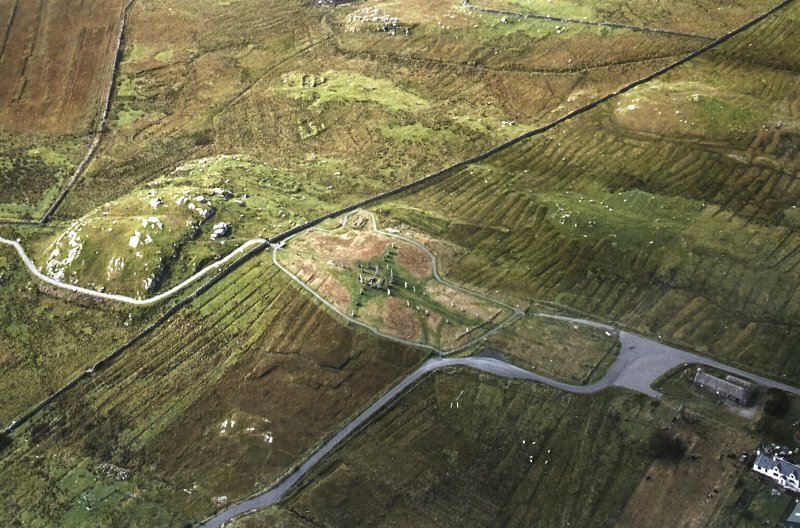 Oblique aerial view centred on the remains of the stone circle, chambered cairn and stone alignments with the township and lazy beds adjacent, taken from the ESE. 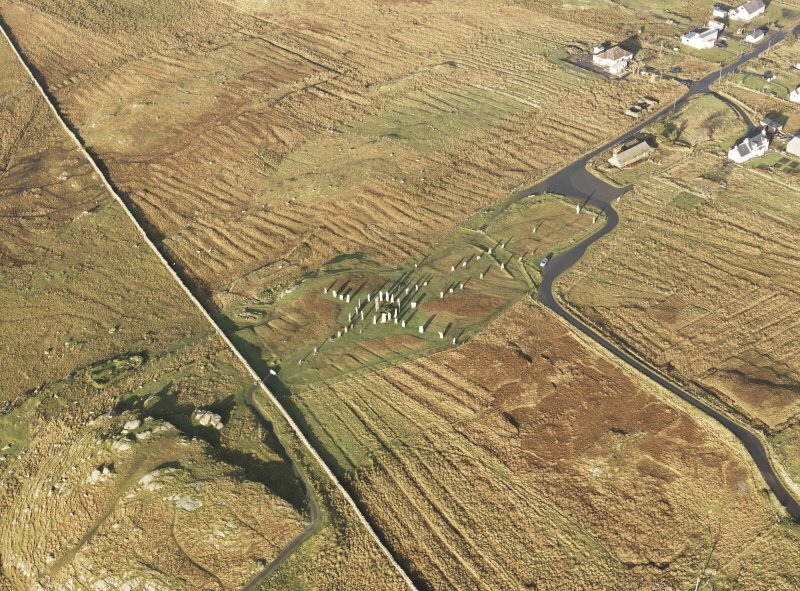 Oblique aerial view centred on the remains of the stone circle, chambered cairn and stone alignments with the township and lazy beds adjacent, taken from the S.
Oblique aerial view centred on the remains of the stone circle and stone alignments with the township and lazy beds adjacent, taken from the S.
Oblique aerial view centred on the remains of the stone circle and stone alignments with the township and lazy beds adjacent, taken from the SW.
General oblique aerial view centred on the stone circle and stone row, the remains of the buildings and lazy beds at Calanais with the visitor centre in the foreground, taken from the S.
Callanish, looking north from central pillar. 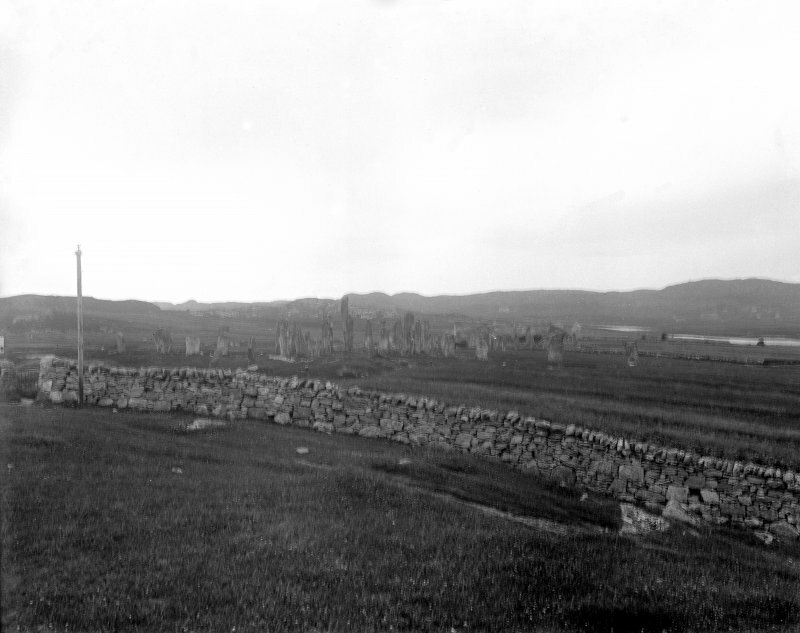 Callanish, circle and cross arms from south. 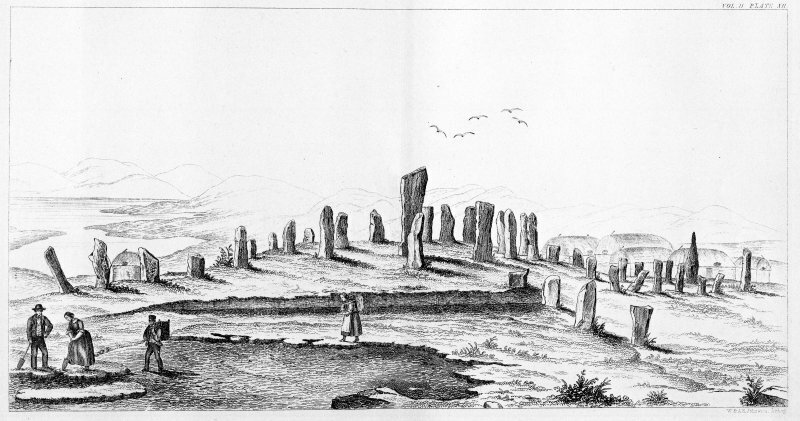 Pencil drawing: plan of Callanish. 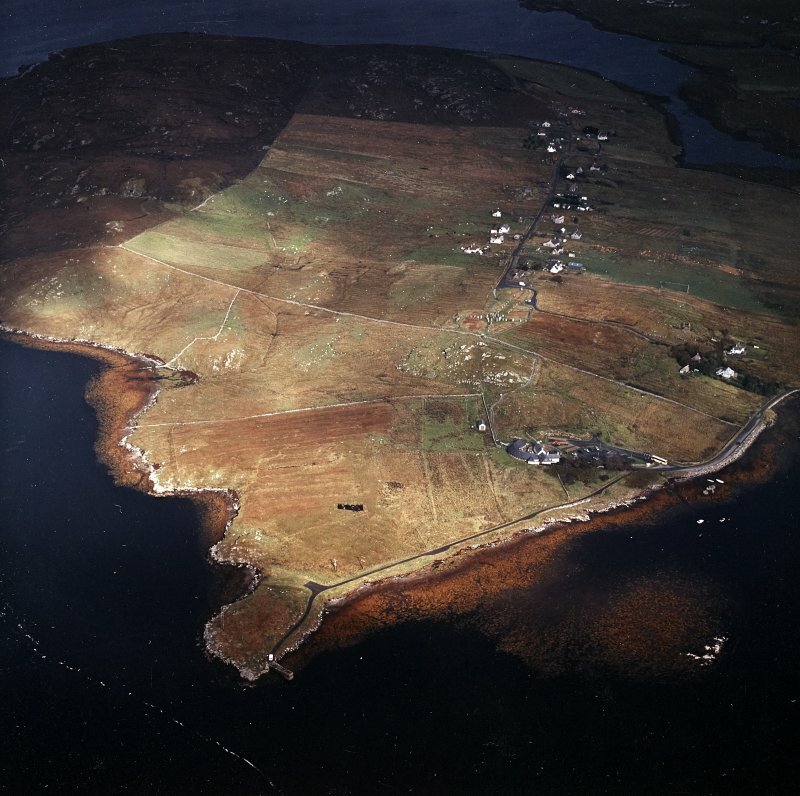 Oblique aerial view centred on the stone circle and stone row, the remains of the buildings and lazy beds at Calanais, taken from the SE. 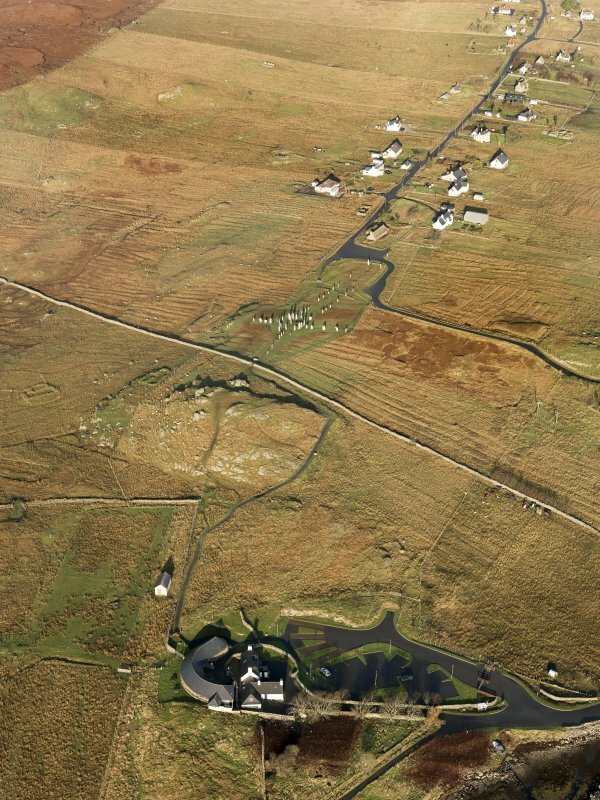 Oblique aerial view centred on the stone circle and stone row, the remains of the buildings and lazy beds at Calanais, taken from the SSW. Callanish. View of stone circle and alignments. 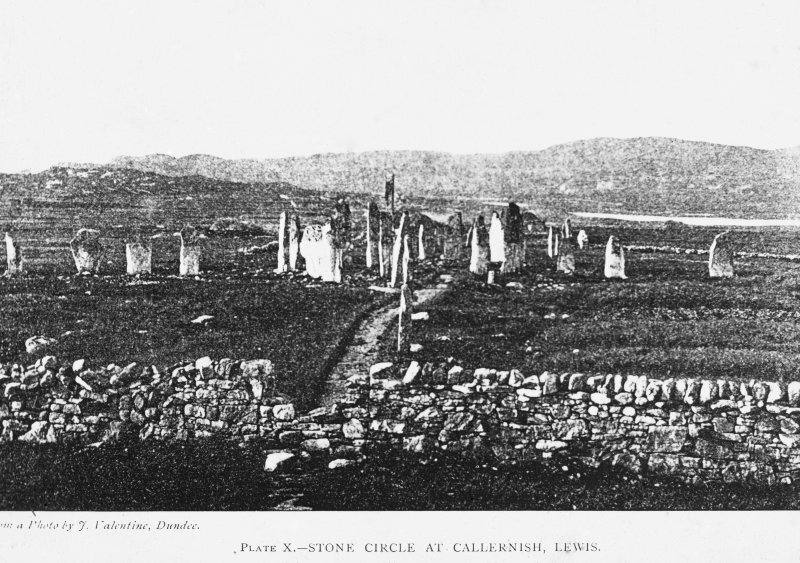 Callanish, stone circle and rows, from south. 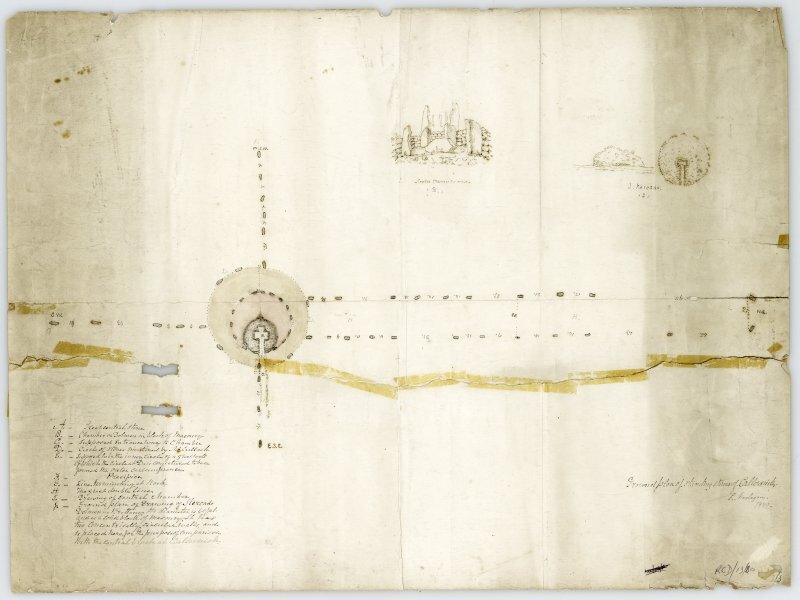 Plan of stone circle and alignments. 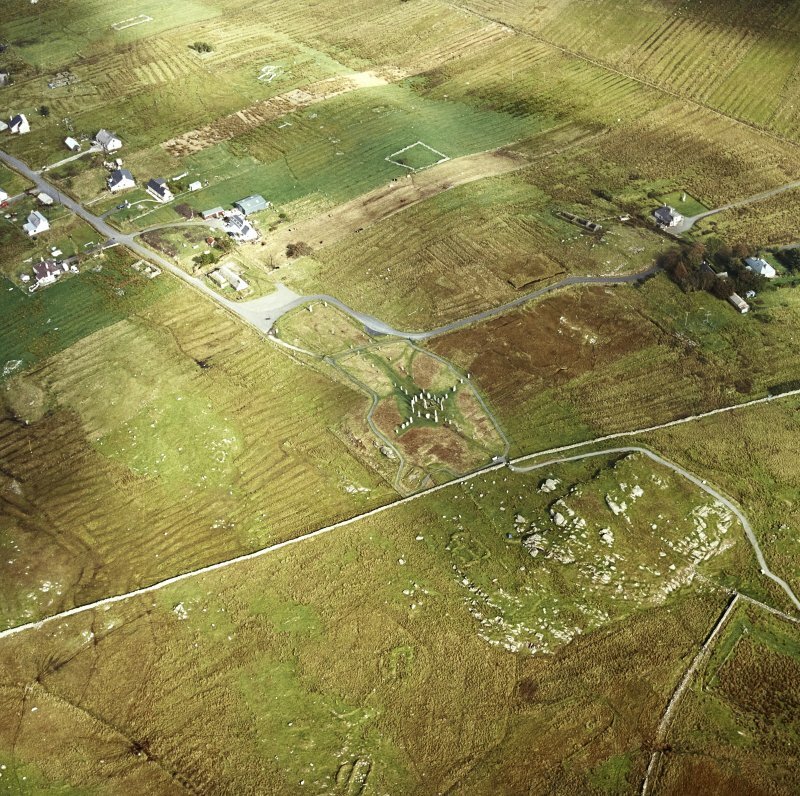 General oblique aerial view centred on the remains of the stone circle, chambered cairn and stone alignments with the farmhouse, visitor centre and township adjacent, taken from the NE. 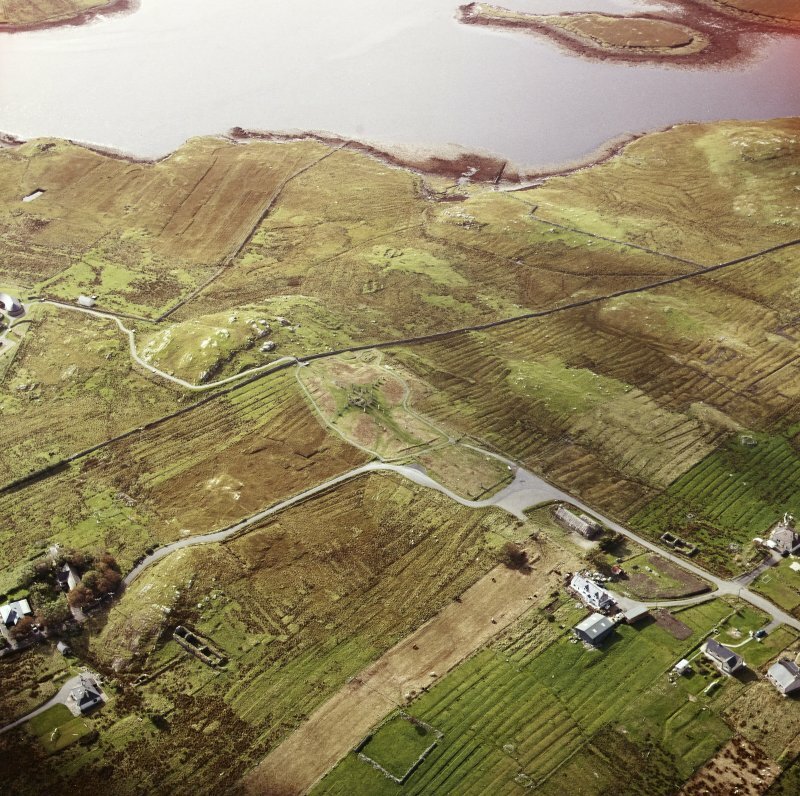 Oblique aerial view centred on the remains of the stone circle, stone alignments and chambered cairn, taken from the WNW. 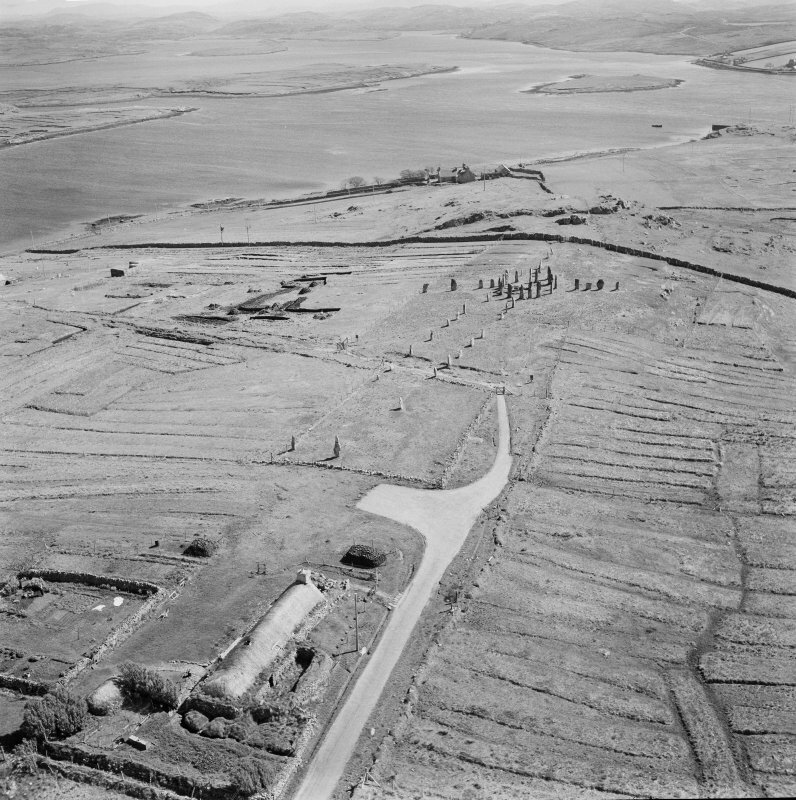 General oblique aerial view centred on the research centre, stone circle and stone alignments with the township adjacent, taken from the SSE. 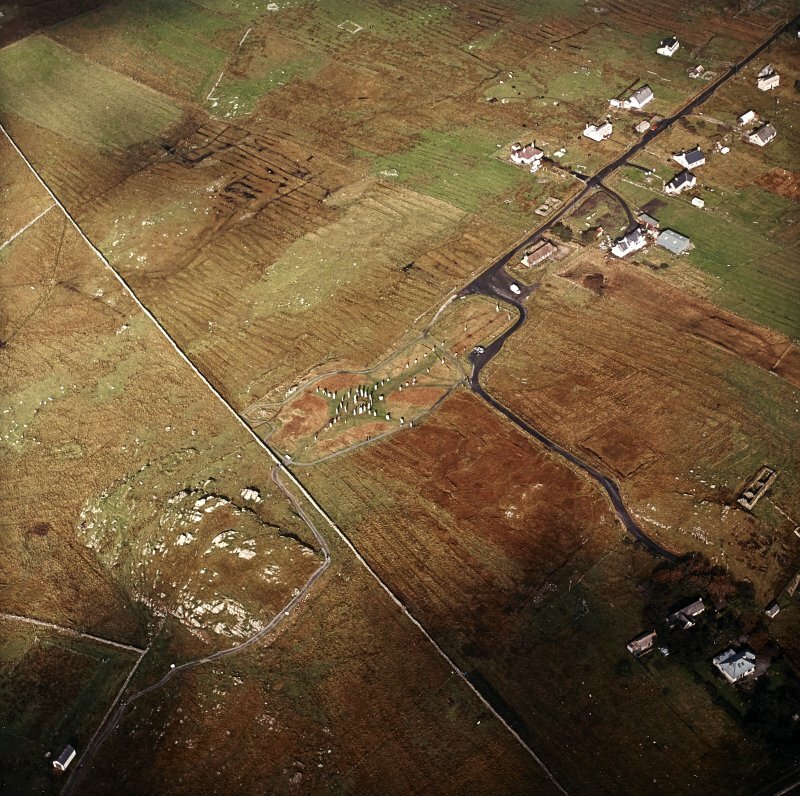 General oblique aerial view centred on the research centre, stone circle and stone alignments with the township adjacent, taken from the SW.
Oblique aerial view centred on the remains of the stone circle, chambered cairn and stone alignments with the township and lazy beds adjacent, taken from the W.
Oblique aerial view centred on the remains of the stone circle and stone alignments with the township and lazy beds adjacent, taken from the NE. 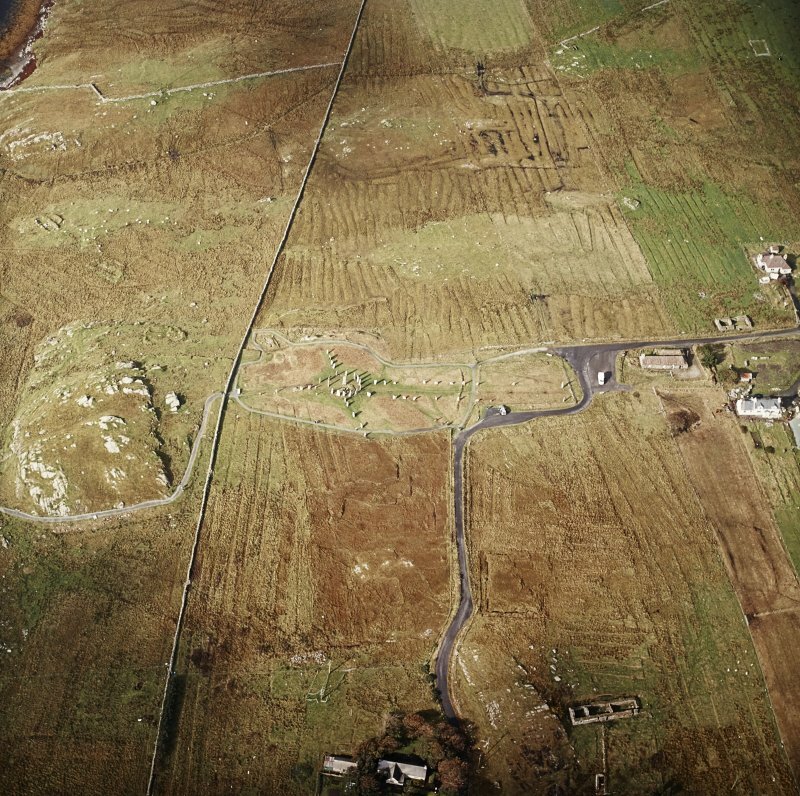 Oblique aerial view centred on the remains of the stone circle and stone alignments with the township and lazy beds adjacent, taken from the ESE. 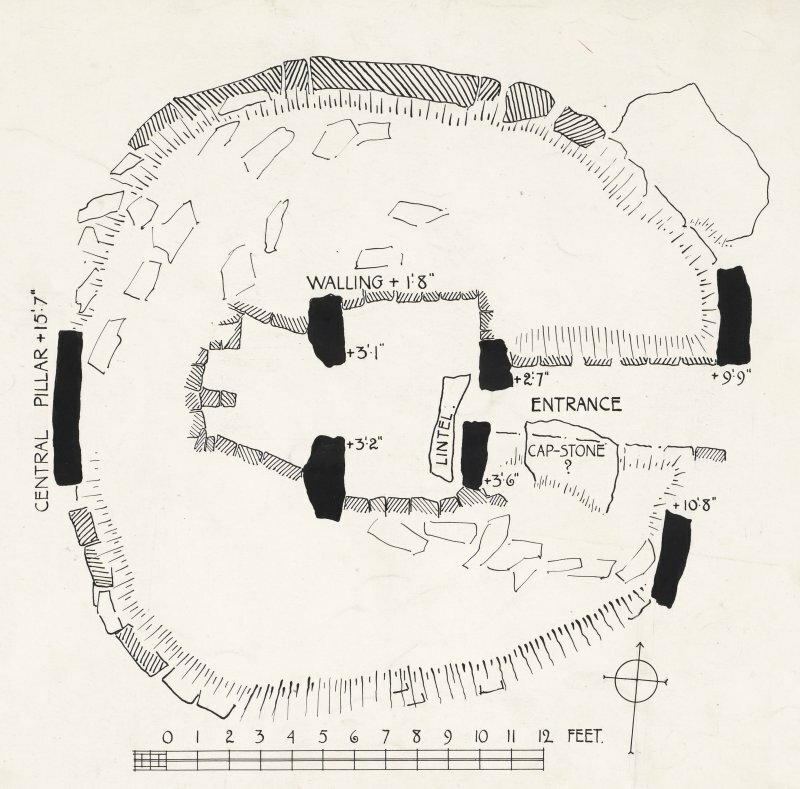 Publication drawing: chambered cairn, Callanish, Lewis. 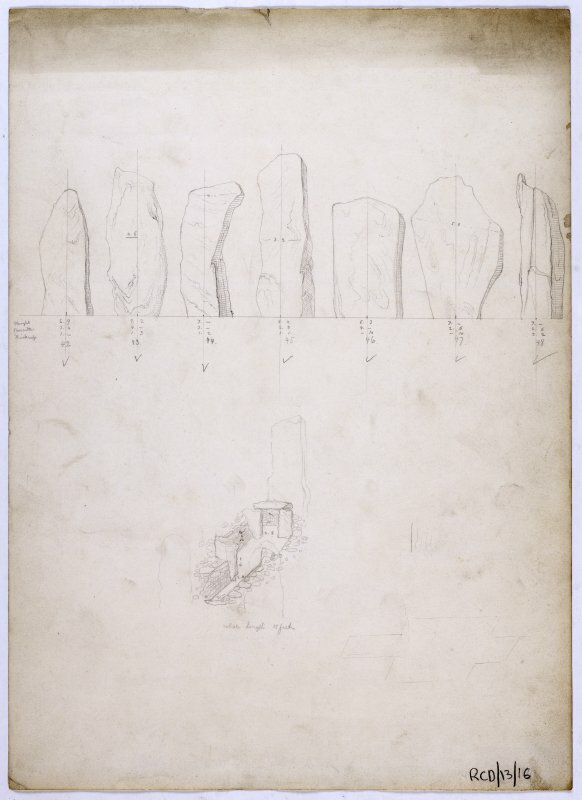 'Ground plan of standing stones at Callernish'. Standing Stones, c.3,000 bc A ring of gneiss slabs surrounding a central monolith, with an avenue running north and single rows extending south, east and west. 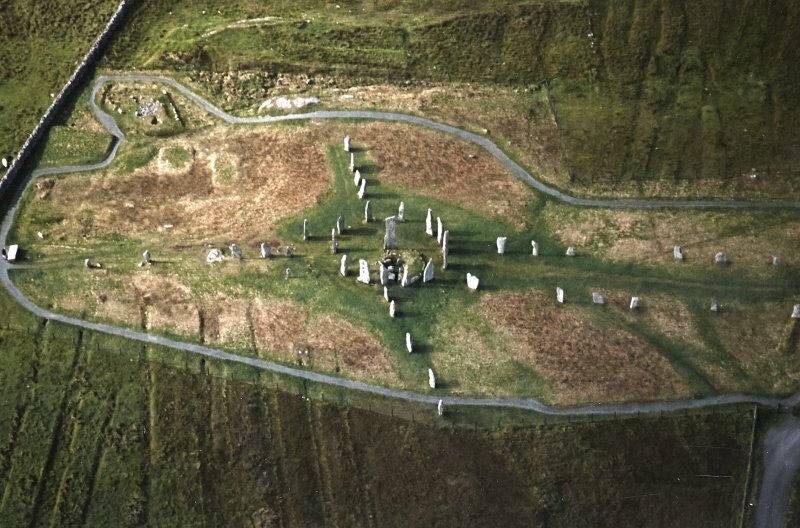 Erected on land that had already been cultivated, this remarkable ritualistic monument, older than Stonehenge, was originally just one row running southwards. Some 1,000 years later a crypt or chambered cairn was added in the centre. This was despoiled some 500 years later and then transformed into a house, an indication of the mixed uses to which the site has been put over the millennia. 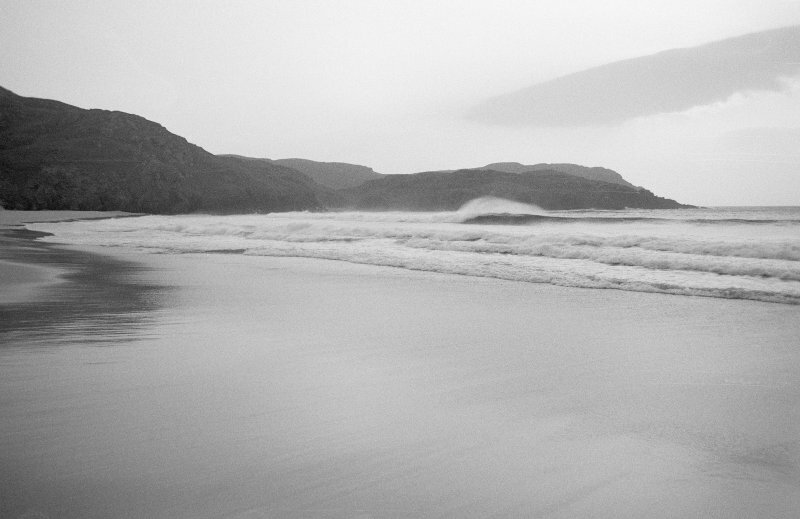 The long process by which it became enveloped in a blanket of peat began around 800 bc. 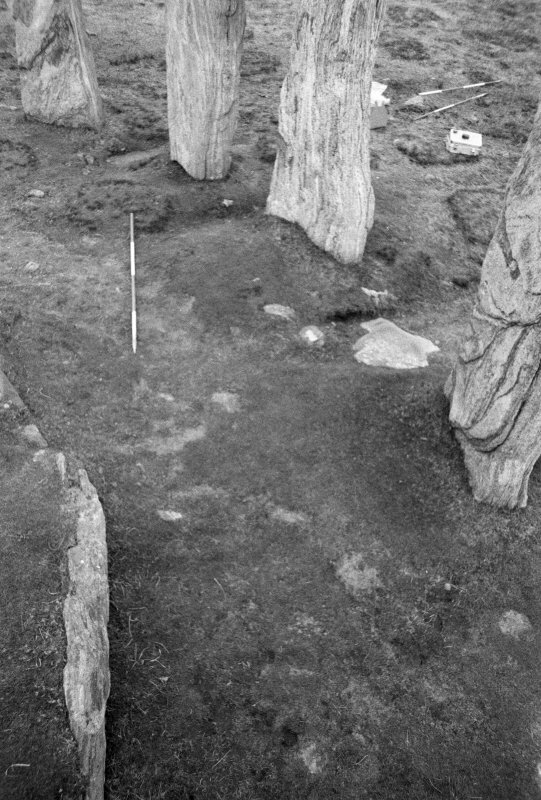 The full extent of this awesome henge was not revealed again until 1857/8, when Sir James Matheson removed 1.5 m of bog. 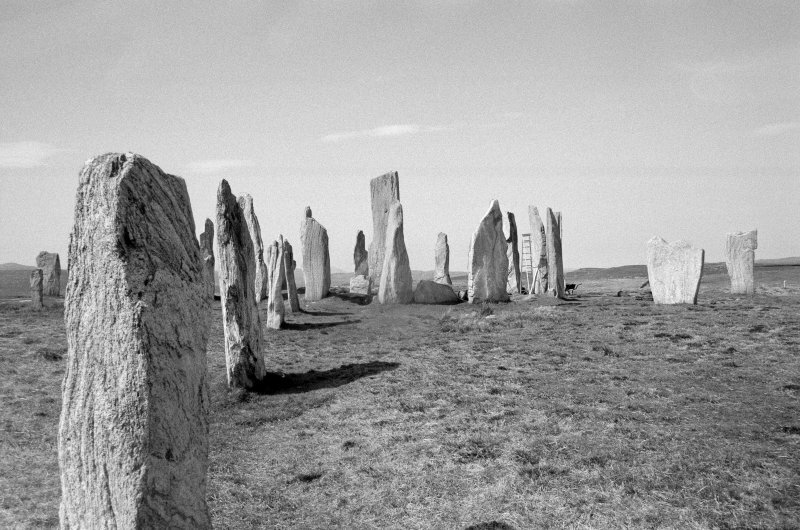 Callanish is the focus of an important group of stones and circles, part of the immensely rich prehistoric heritage of the Hebridean archipelago, which falls outwith the remit of this book. 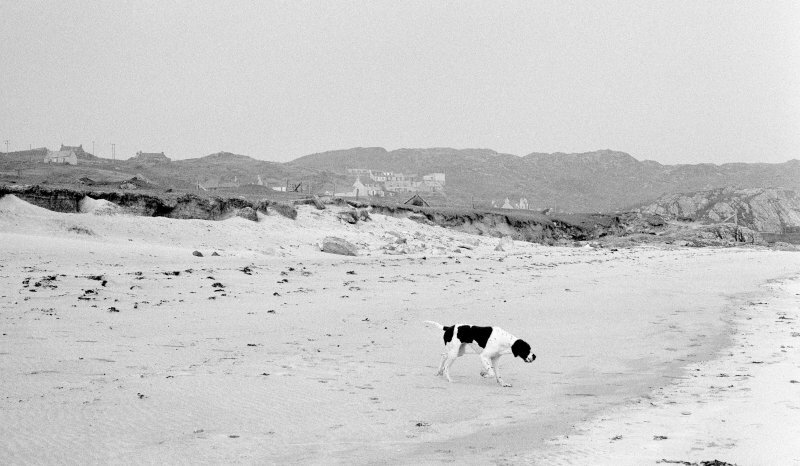 Calanais Visitors' Centre, Michael Leybourne, Western Isles Council Technical Services Consultancy, 1995 Low-lying, kidney-shaped gallery carefully sited in the fall of the land, fusing new form and function with elements of the local vernacular. A curving timber clerestory offers sweeping views over the mountain fields and drowned valleys of this primeval landscape. For miscellaneous finds in area (now in the Royal Museum of Scotland [RMS]) see NB23SW 23 (formerly recorded with NB23SW 1). The Object Name Book (OS) decribes the stone circle thus: ' A circle of stones with one stone in the centre, two rows parallel to each other extending Northwards from the circle; one to the coast and one to the South. They are about forty in number. The inhabitants say that the numbers of these stones cannot be counted. They are the supposed remains of a druidical place of worship. They all stand on end at the distance of five and six yards from each other and are in a rough natural state as taken from the shore, it is stated that some of them are so large that it is inconceivable how they could have been brought to the place. 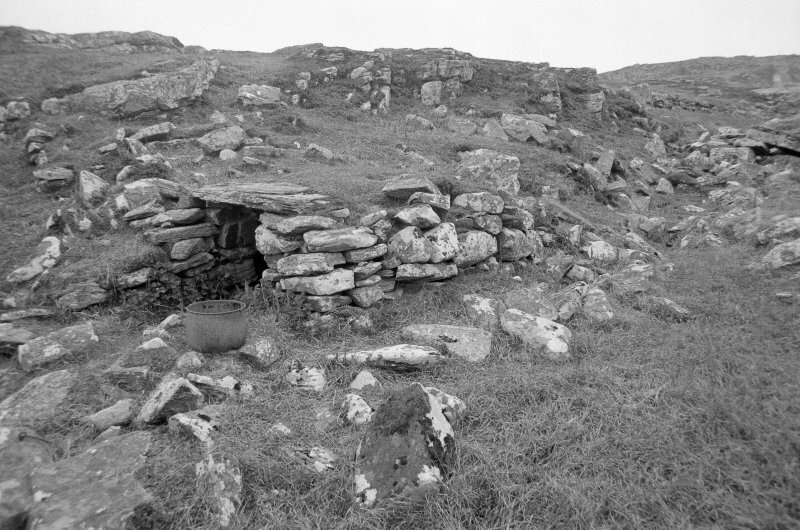 A megalithic setting with an obviously secondary (A S Henshall 1972) chambered cairn, and another cairn which is not necessarily part of the megalithic scheme. 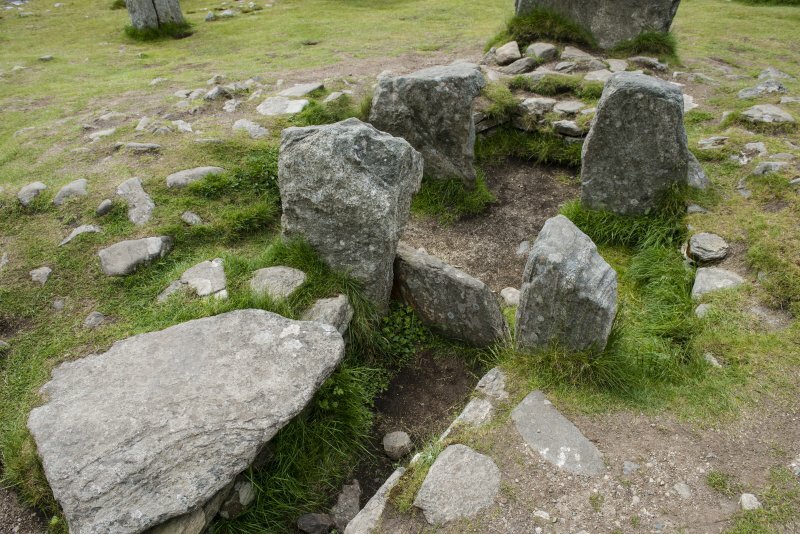 The chambered cairn is set eccentrically within the circle, incorporating the central pillar within the line of its kerb on the west and two of the stones of the circle on the east. 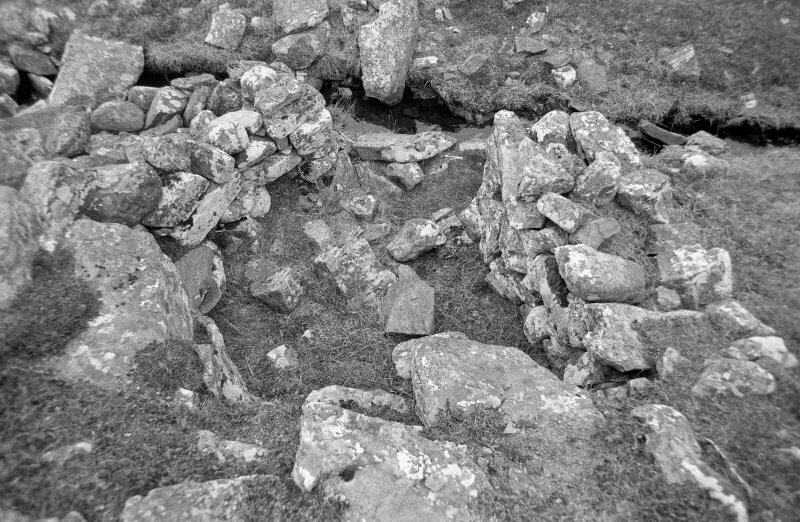 Cairn material still remains to a depth of 2' but the double chamber has been deroofed - probably in antiquity, since Matheson (J Matheson 1862) appears to have found it in much the same state as it is today. On the south side the cairn appears to be joined to a slightly raised causeway which runs down the south alignment. J Matheson 1862; RCAHMS 1928; A S Henshall 1972. As described and planned. 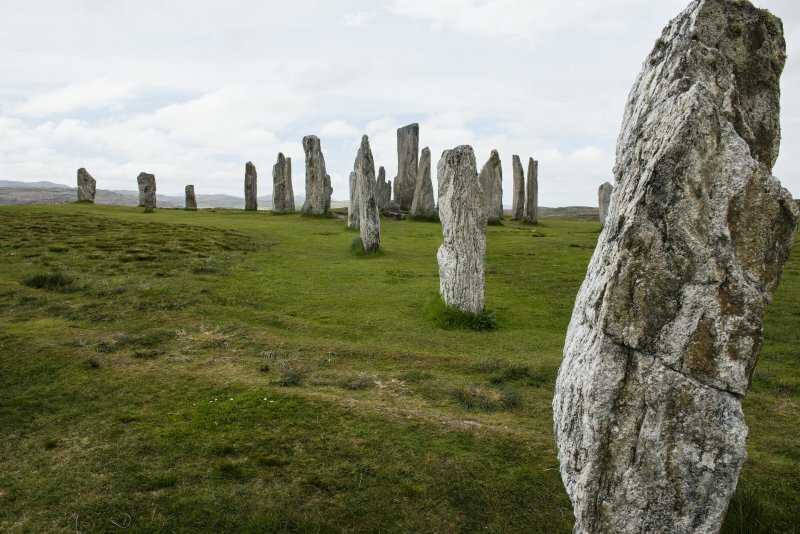 Known locally as the 'Standing Stones of Callanish'. Visited by OS (R L) 25 June 1969. 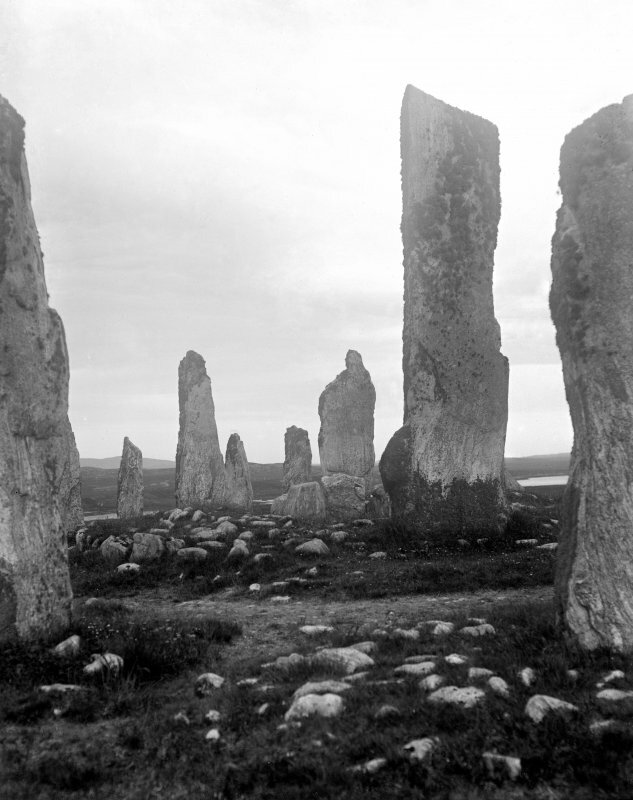 A collection of written and illustrative material concerning the Callanish stones dating from c1680 to the mid- to late 1970s was compiled by Margaret Ponting (now Curtis) and Gerald Ponting. It consists of five volumes of loose leaf A3 pages. 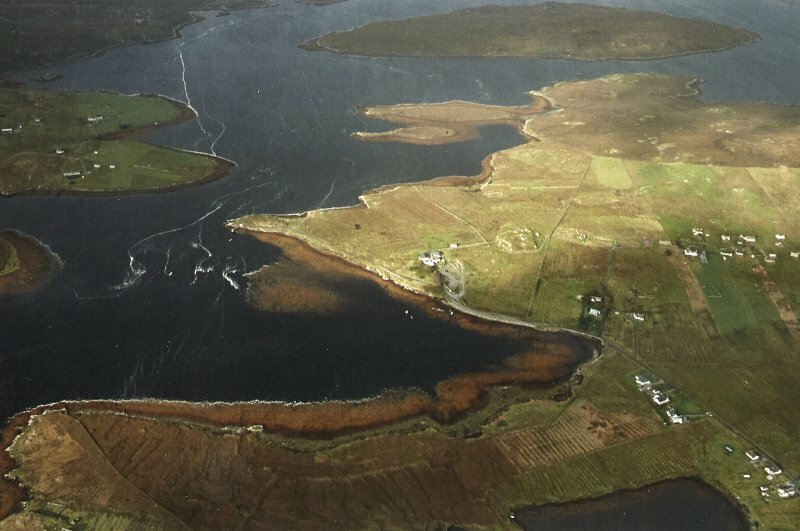 Four volumes concern the main site Callanish l, 1979, and one volume about the minor sites Callanish ll, lll, lV, V, Vl, Vll, Vlll, lX, X, Xl, Xll, Phrionnsa, Xlll–XlX, May 1981.
knowledge widely available. 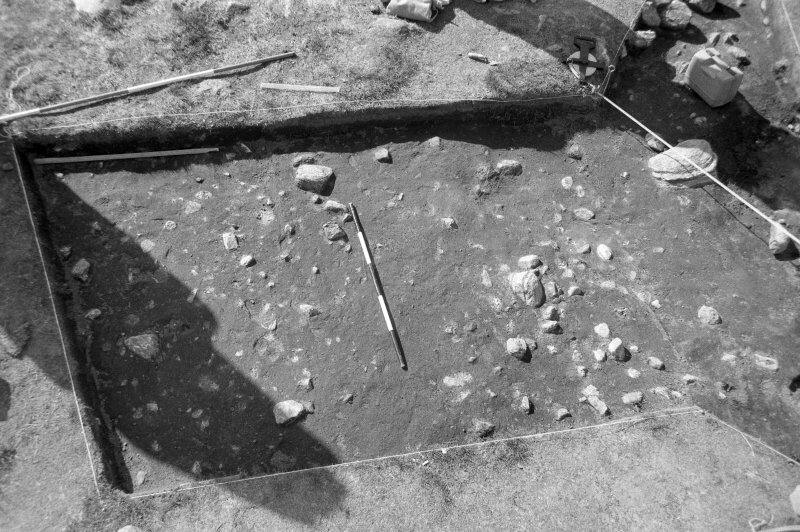 The original fieldwork in the 1970s was not submitted to DES. 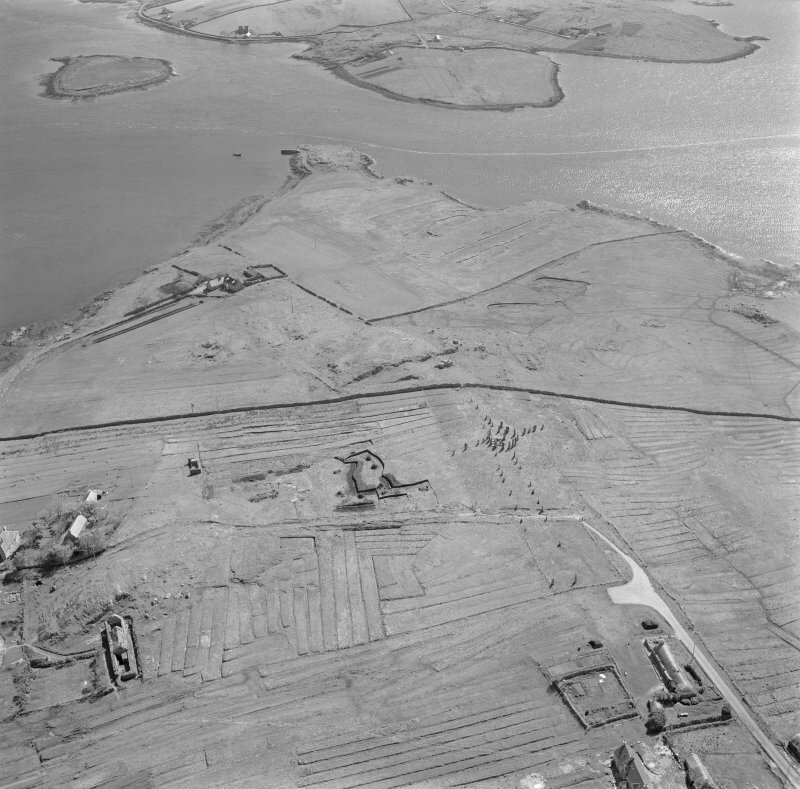 The original work will be deposited with RCAHMS. 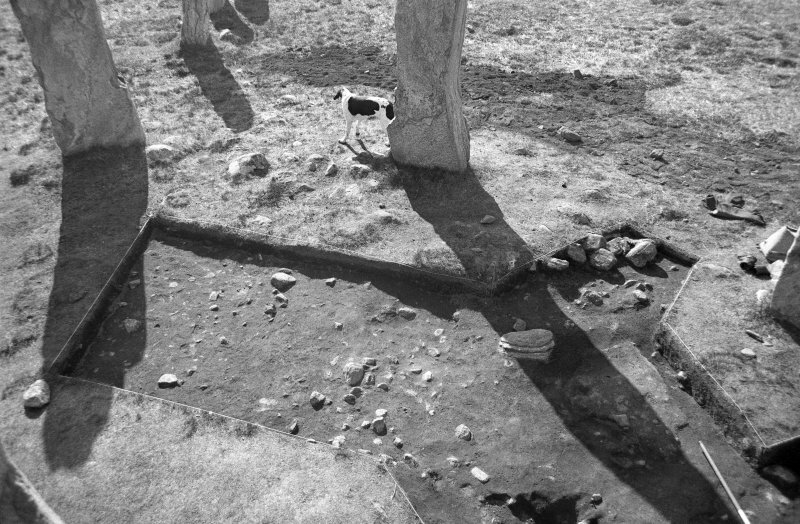 Oblique aerial photographs of the stone circle and stone row, Callanish, Lewis, photographed by John Dewar in 1966. 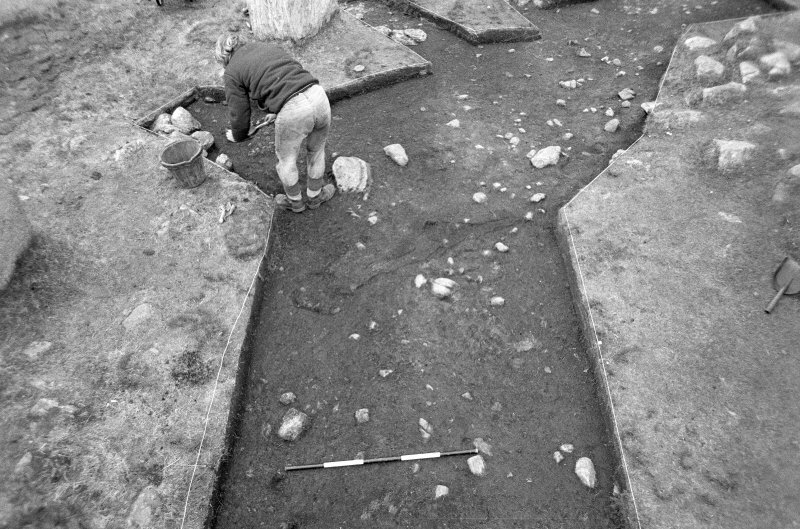 1980-1981 excavation at Callanish by Patrick Ashmore, Historic Scotland. 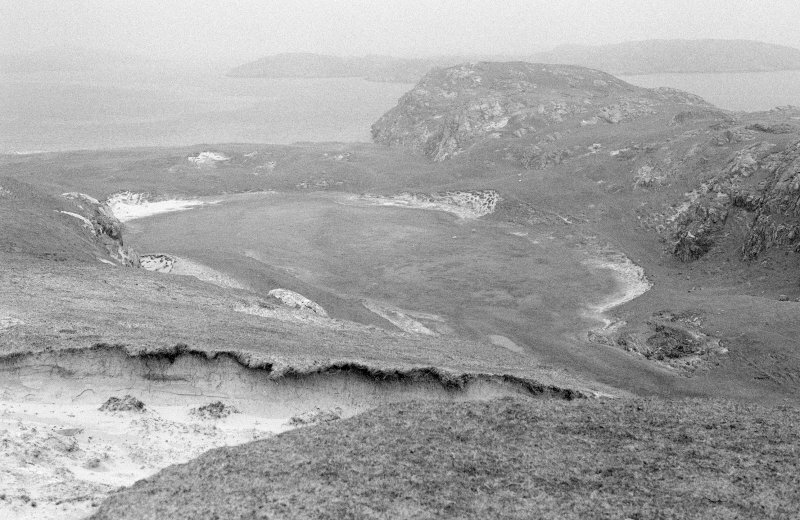 The main site stands on the southern end of a ridge of rock, on the east shore of Loch Roag. It is visible from a considerable distance in some directions and is particularly impressive when seen against the skyline. standing to a height of 4.75m. To the north, lines of ten and nine stones form the west and east sides of an avenue about 82m long. 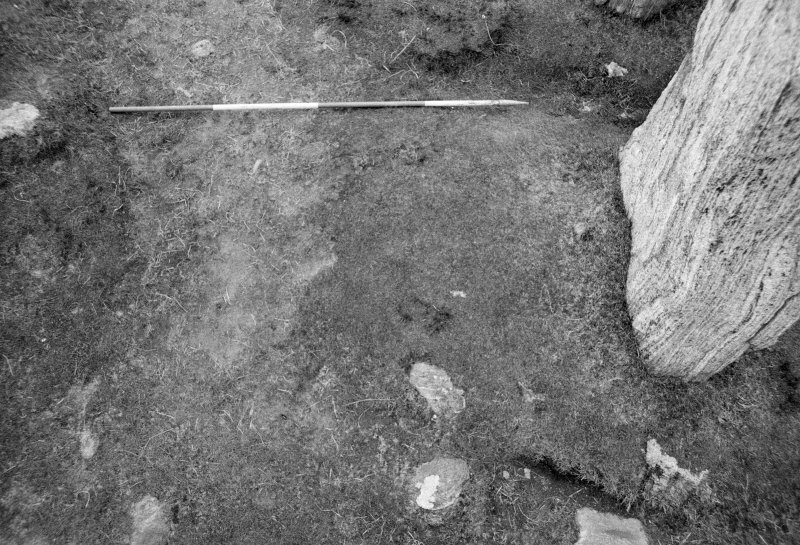 The spacing and height of these stones is irregular; there are long gaps at the northern end, but the northernmost stones of each line may mark the original end of the avenue, particularly as one is squarish in section and the other stands at right angles to the line. 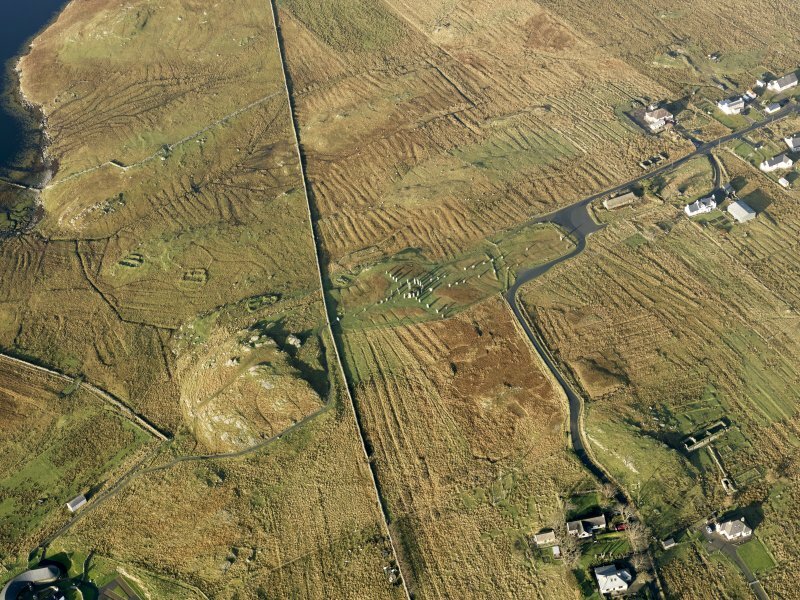 The western line contains four stones and the eastern five, the outermost recently raised from beneath its covering of peat and replaced upright in its original socket. The southern line also contains five stones, and close to the circle there is an extra stone to east and west of this line; the eastern one was placed there in the nineteenth century and may not be part of the original plan. The southern line of stones is almost precisely on a north-south line, but the other lines and the avenue do not mark true cardinal points in relation to the circle. 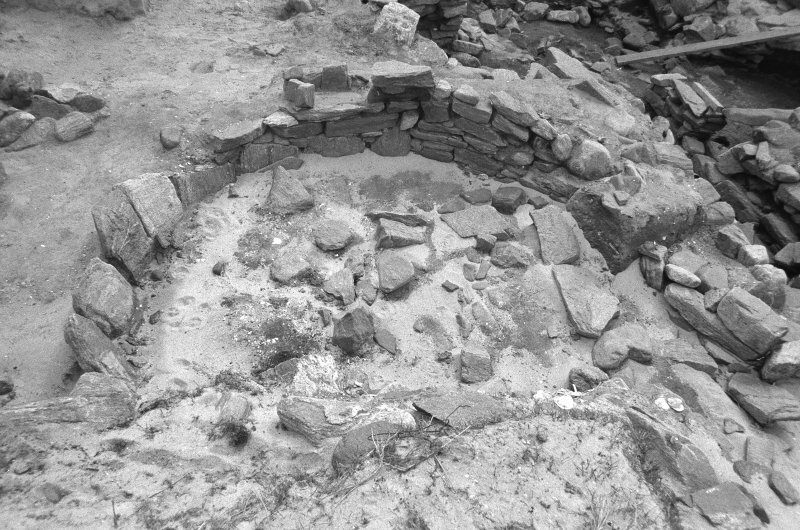 A large oval heap of stones to the south-west of the circle, near the perimeter fence, bears a superficial resemblance to a chambered cairn; it is, however, related to the hamlet that formerly stood near the monument and is almost certainly a corn-drying kiln. Fillibhir (Callanish lID is visible from the A 858 to the south-east of the main circle. Access is by wooden steps over the fence. 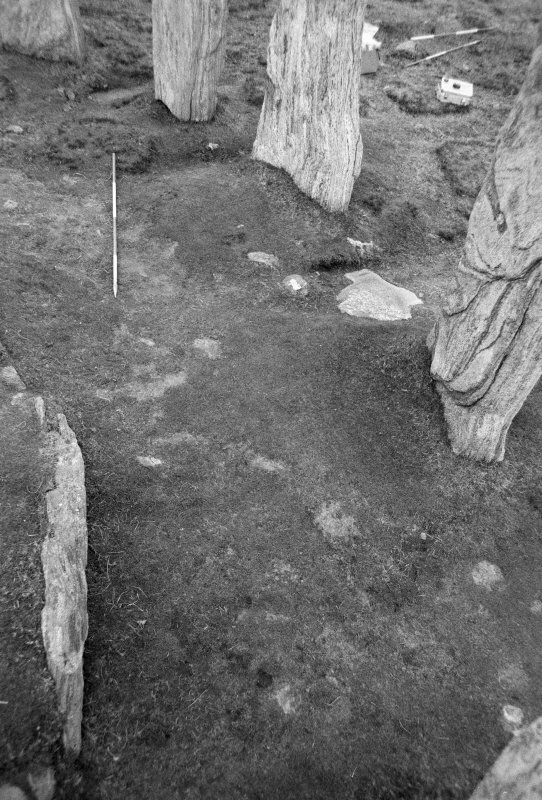 This appears to have been a double circle, the inner represented by four standing stones, and the outer by eight standing stones as well as five which have fallen. 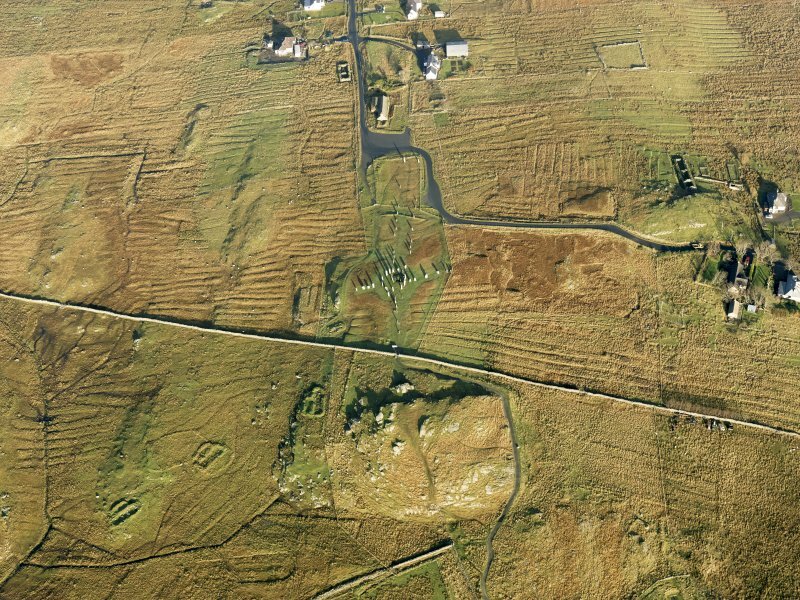 Another circle, known as Garynahine or Ceann Hulavig (Callanish IV) can be seen to the west of the Uig road (B 8011) on a hill about 1.5km south of Garynahine Lodge. 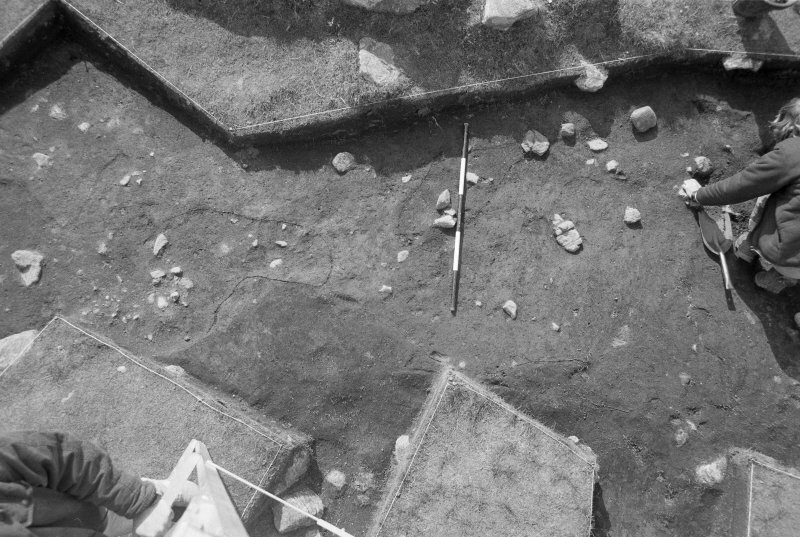 Five impressive stones form an oval (13m by 9m); the centre has been excavated and appears to contain an upright stone surrounded by a small cairn. This ancient monument is arguably the most impressive in Britain after Stonehenge and called for what have come to be recognised as civil engineering skills in its creation. 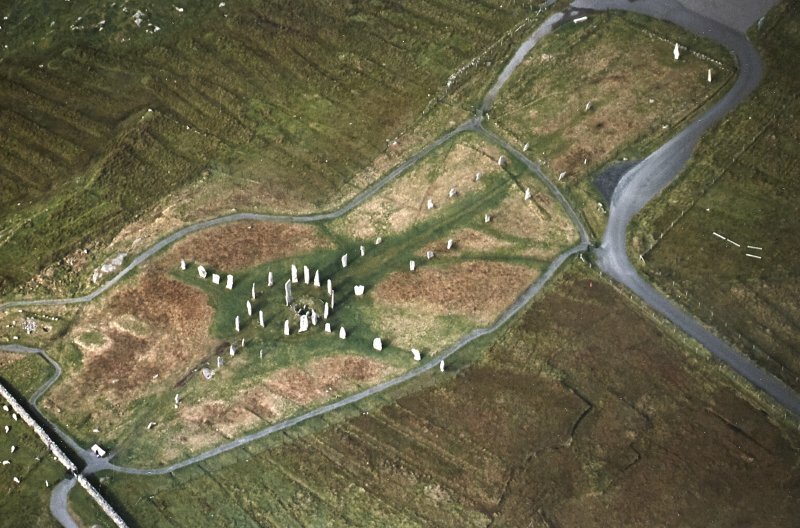 It includes thirteen tall stones forming a circle some 37 ft in diameter on a remote moorland. 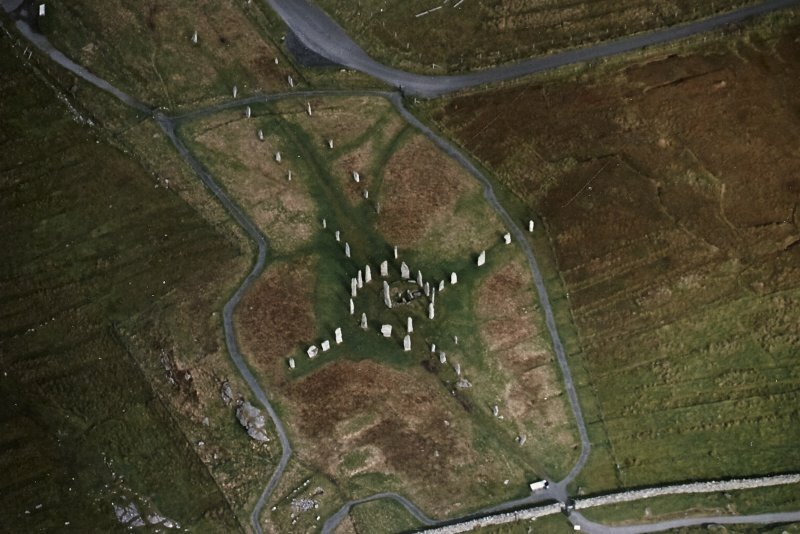 To the north of this circle stretches an avenue of stones 270 ft long and 27 ft wide, of which 19 stones remain. To the south of the circle there is a shorter, narrower avenue formed of six stones, and to the east and west there are short arms formed of four stones each. Within the main circle is a burial cairn, and opposite the entrance to this stands the tallest stone of the monument, some 16 ft in height. The alignment of the stones relates to astronomical observations. The construction of the monument is generally dated from the Bronze Age, or about 1500 BC, and must have required the organisation of a labour force and tenacity of purpose extending over many years. A resistivity survey was undertaken by GUARD in 2008. 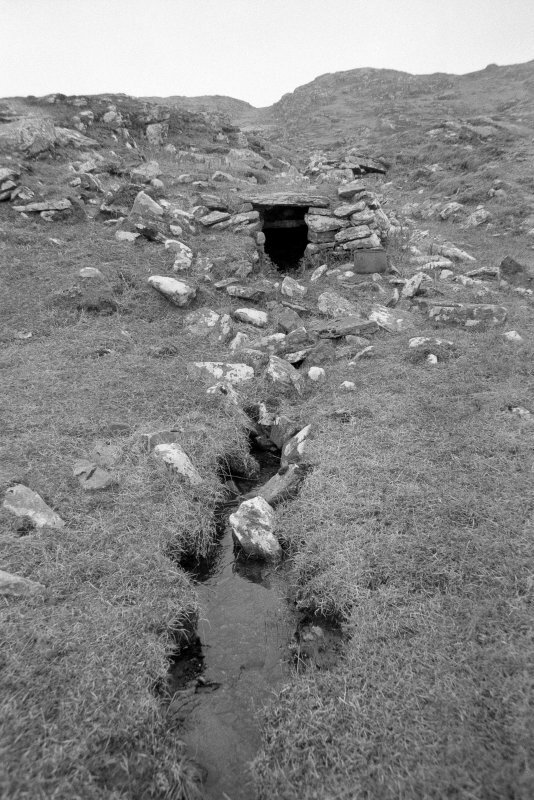 The kerbed and unkerbed stone settings, whose origins remain to be established, are located within the Callanish Complex, a ritual landscape around Callanish with at least ten stone circles, five similar smaller stone settings, seven rows of stones, nine single stones and many burial cairns. Some sites ‘operate’ singly but others form interlinked groups. 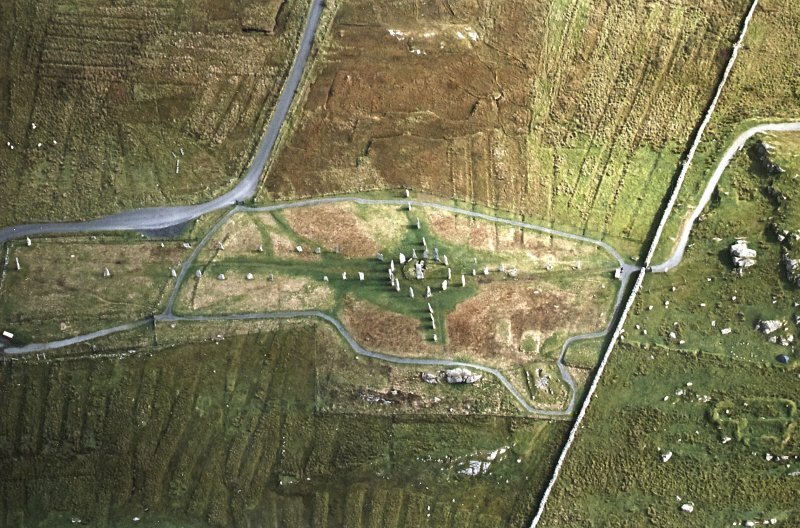 The standing stones of Callanish XVl and the burial cairn Callanish XXlV can be regarded as parts of Callanish l, forming the terminals of the N–S row and the avenue respectively. 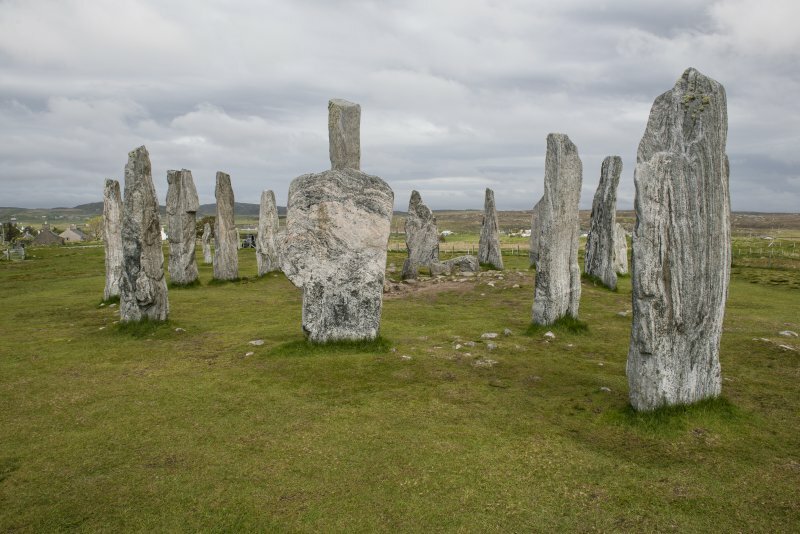 Each stands on the first hill in its direction from site l. Sites Callanish l and XXlV each incorporate a flattened circle whose long axes extend the line of the avenue. 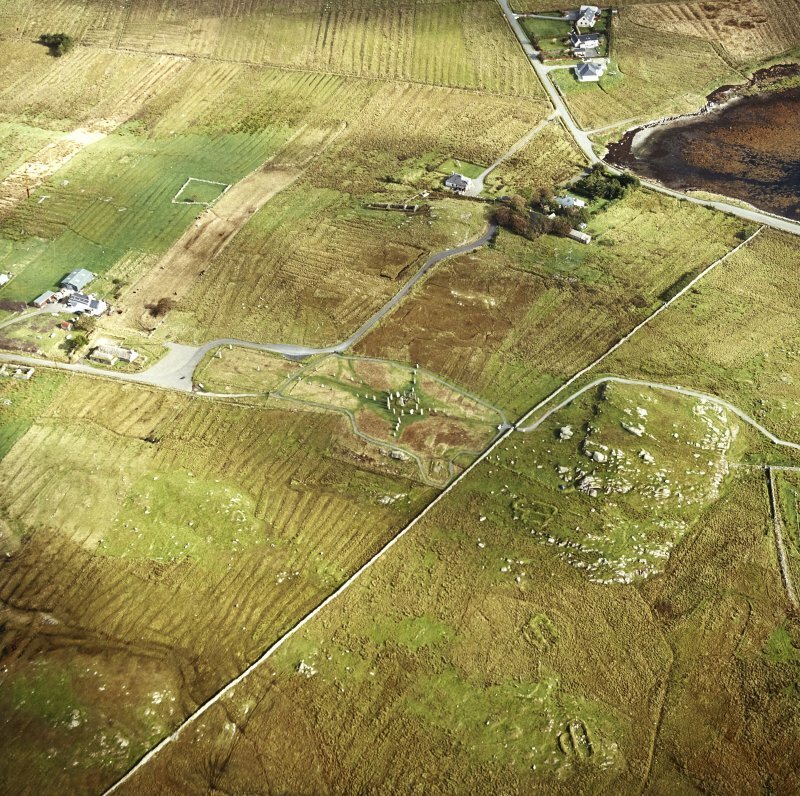 The first phase entrance of the cairn is directed towards Callanish l. The second phase entrance of the cairn is directed towards the large stone circle of Callanish XXV, NB 2218 3484 (DES 2003, 138), which itself has outliers (DES 2005,149 and unpublished material) (The Stones Around Callanish: Ponting and Curtis 2000, 45–52). 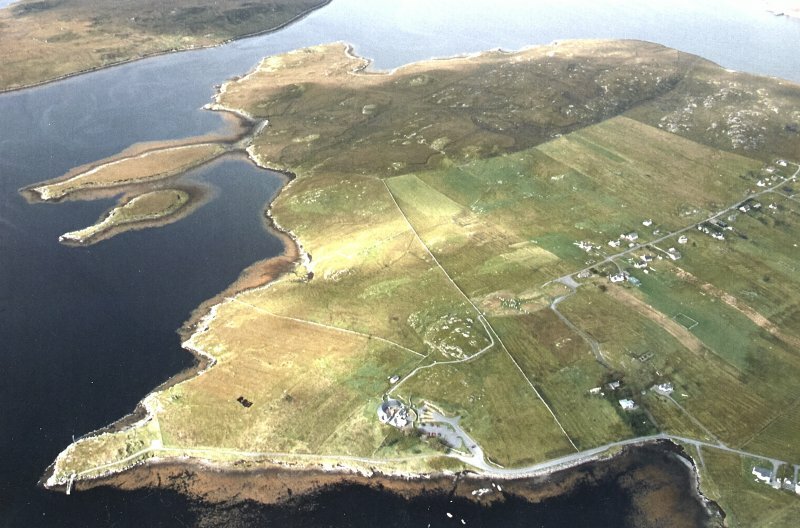 The concentration of kerbed and unkerbed stone settings lies 11–25m E of a straight line from the avenue at the Callanish standing stones at NB 213 330 to the prehistoric burial cairn Callanish XXlV on the first hillock 1.6km away at NB 2179 3473 (DES 1995,110; 1996, 112–3; 1997, 86; 1999, 94 and 2001,127). 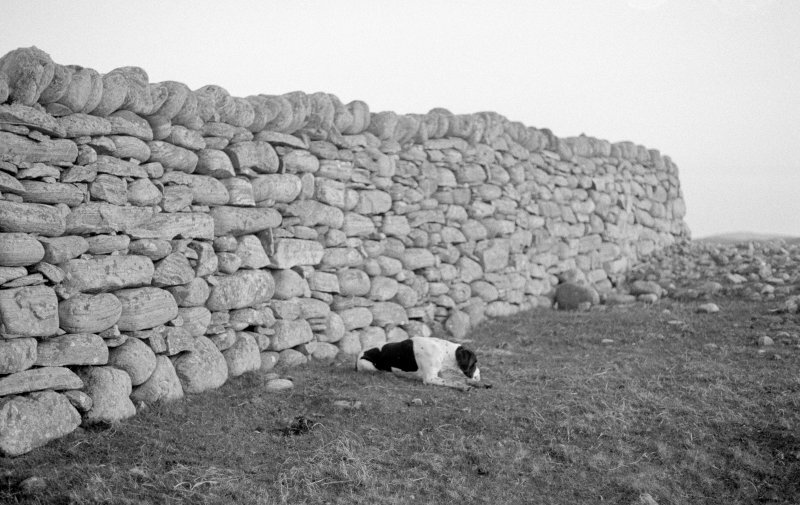 It has been suggested that this cairn was used for excarnation (among other things) and that the remains were carried along a processional route to funerary activities at Callanish l on appropriate occasions such as the full moon. Such a processional route would not be necessarily absolutely straight. It may well have passed alongside or between the kerbed and unkerbed stone settings. The Sleeping Beauty range of hills which stands c22km to the SSE is where the moon rises at the S extreme. Together with Beinn Mhor and Roineval, it is visible from all the 13 stone settings on the three crofts, but not from the higher ground to the W. Cnoc Ghilleaspuig forms the horizon to the S c400–500m away and grades into the adjacent land where the stones of Callanish l c500–700m away are silhouetted on the horizon to the SSW. The view of them is currently restricted by agricultural buildings and houses. A barn and house obscure most of the stones of Callanish l. None of the Clisham range of hills can be seen behind Callanish l.
This horizon survey would hardly vary in relation to the Sleeping Beauty hills, Beinn Mhor and Roineval if made from the kerbed settings D1, D3, S1, S4 or R7. However, the distance between the right hand (W) slope of Roineval and the left hand (E) slope of Cnoc Ghilleaspuig (or its top) would vary from zero degrees of azimuth if made from D1 where the slopes coincide to some 11° of azimuth if made from R7; i.e. seen from D1, after skimming Roineval, the moon rolls low along Cnoc Ghilleaspuig until it sets in/near Callanish l about 1 hour 45 minutes after rising from the Sleeping Beauty. (Diodorus of Sicily: the moon god visits the face of the earth every nineteen years). 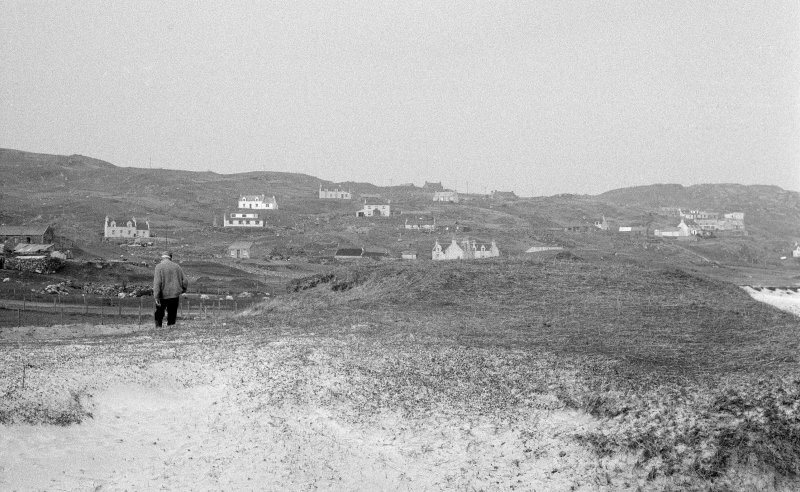 This skimming of the horizon fits in very well with the idea that Diodorus was describing the Isle of Lewis when he wrote about the Hyperboreans in 55 BC. But seen from the stone settings further N, the moon’s path would cross the open sky between Roineval and Cnoc Ghilleaspuig. From the more northerly and easterly stone settings, a wide space can be seen between the Sleeping Beauty hills, Beinn Mhor, and Roineval, and the E slope of Cnoc Ghilleaspuig (c10°of azimuth from R9 and 11° from R6). From them, part or all of the E row and part of the circle can be seen today left of the barn. The complete Sleeping Beauty range of hills, Beinn Mhor and Roineval where the moon rises at the S extreme cannot be seen from the land W of the kerbed and unkerbed stone settings, as the view is partly blocked by Cnoc Ghilleaspuig. Seen from the N end of the avenue at the Callanish l, at the exact moment of the S extreme of the moon, the moon also rises from the Sleeping Beauty, Beinn Mhor and Roineval, passes low at due S, skims some stones of the E row, then dips into Cnoc an Tursa, then disappears, then reappears briefly at the foot of the tall central stone at the head of the burial cairn. 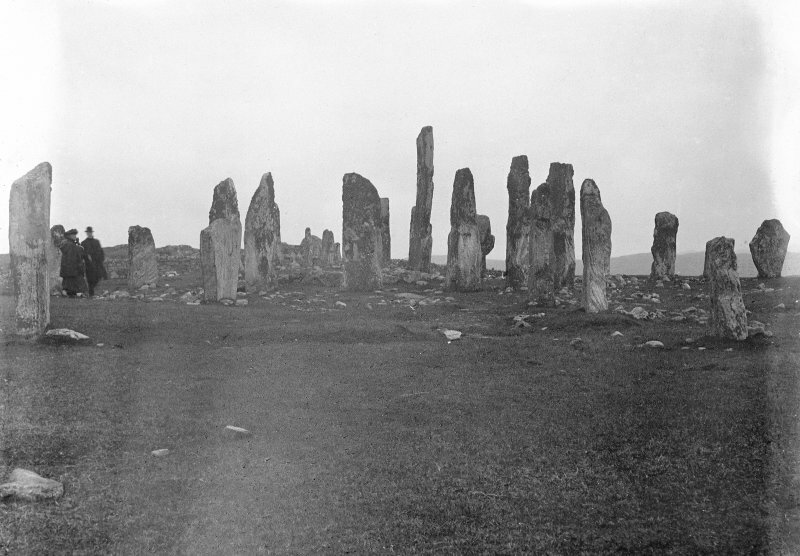 But seen from the kerbed and unkerbed stone settings at the exact moment of the S extreme moon, the moon would NOT appear among the stones of Callanish l, whatever the perturbation in its 173 day cycle. Perhaps people at the stone settings watched the moon set into the ground at 189° of azimuth then proceeded c545m to the N end of the avenue to see a symbolic rebirth of the moon in the circle at 192° of azimuth twelve minutes later. Furthermore, the S extreme moon does not reach its maximum declination for that month at any particular azimuth 0–360°, i.e. in any particular direction. The moon may even be below the horizon at its maximum. This daily declination deficit affects the height of the moon’s path above the S horizon (and therefore its rise and set positions). In practical terms seen from the kerbed and unkerbed stone settings area, the moon passes among or sets behind the standing stones once or twice a month for a few years each side of the extreme; and passes low above the tops of the stones of the circle for a few more years. 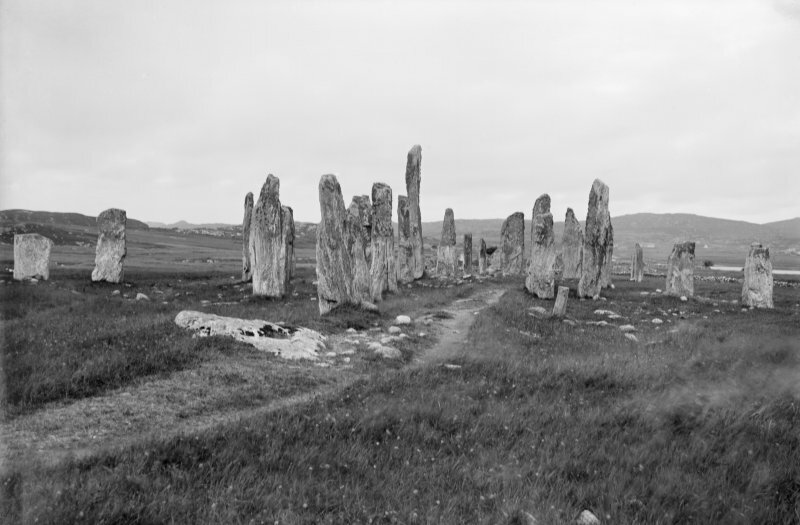 The rare occasions when the moon set before reaching the Callanish Stones may have had symbolic significance in funerary activities. The phase of the moon would vary/grade from full moon in the summer, to half moon at the spring and autumn equinoxes, to new moon in the winter. 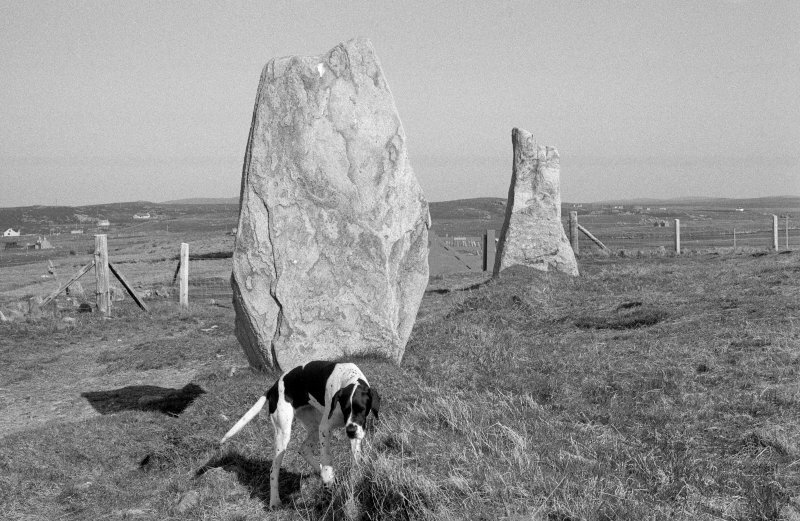 The perturbation cycle and daily declination deficit are described in Callanish: Stones Moon and Sacred Landscape (MR Curtis and GR Curtis; 1990, 29). 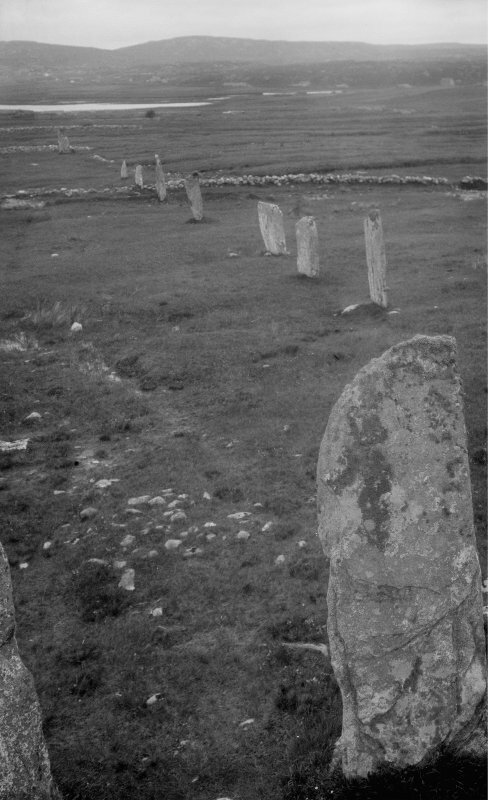 The way in which the height of the S extreme moon’s path was/could have been predicted at Callanish l using the E side of the avenue and standing stones with hornblend is described in Callanish: Stones Moon and Sacred Landscape (MR Curtis and GR Curtis; 1990, 28–9) and Callanish: Stones, Moon and Sacred Landscape 2009 Extrapolation (MR Curtis and GR Curtis, 1990). 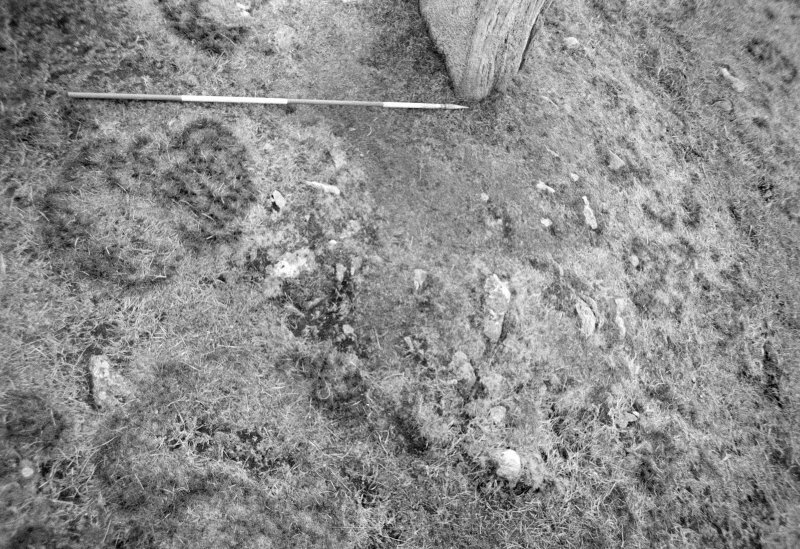 NB 213 338 Callanish XVl Cliacabhadh Site XVl is the N terminal of the N–S row at site l. It consists of tall stone 29: de-topped stone 28: stone 27: stone 26: exposed bedrock with hollow: stone 25: stone 24: displaced stone near gate: 2 socket holes by Cnoc an Tursa. 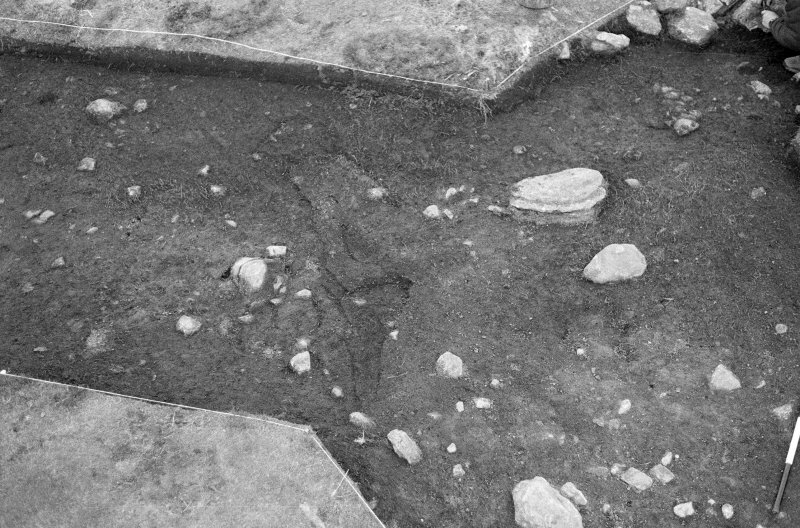 Additional information relating to this site may be found in DES 1976, 59 and The Stones Around Callanish (Ponting and Curtis, 39). 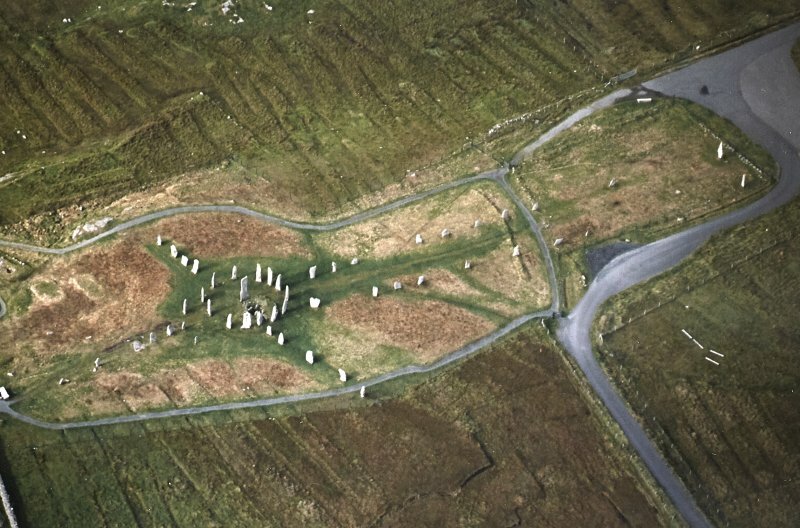 It has been suggested that the route from the cairn Callanish XXlV to the main site, Callanish l, was used for funerary purposes, but that the southwards route from the standing stone site at Callanish XVl to Callanish l, 800m away, was used for a range of everyday activities and special occasions such as trade, marriages, midwinter or the S extreme moon. 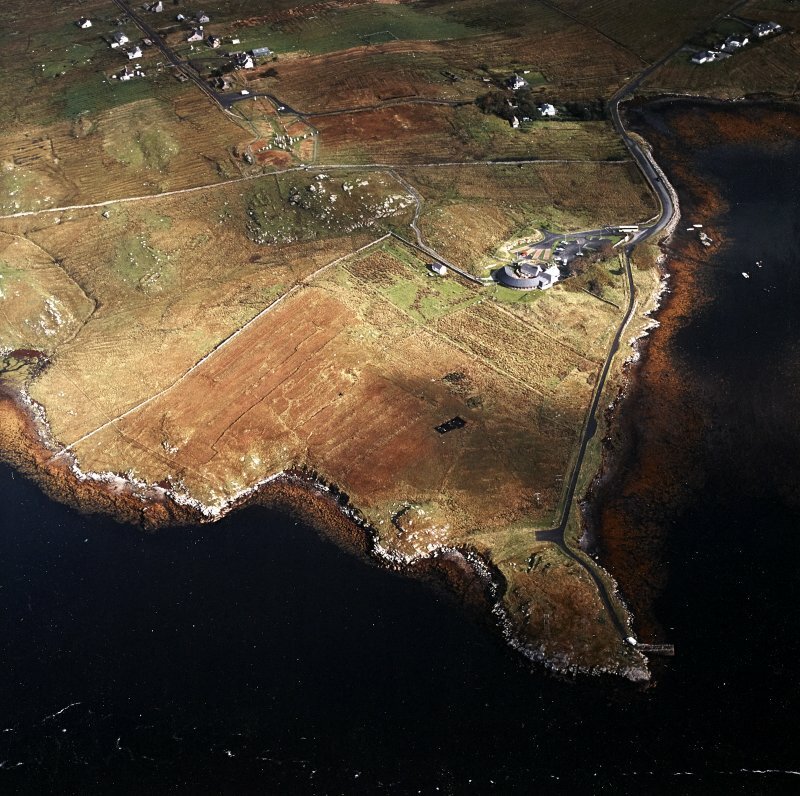 From Callanish XVl, Cnoc an Tursa and the main site can be seen against a far horizon. Only the top of the tall stone in the circle is silhouetted against the sky at 181° 6 minutes of azimuth and at a height of 0° 54 minutes. 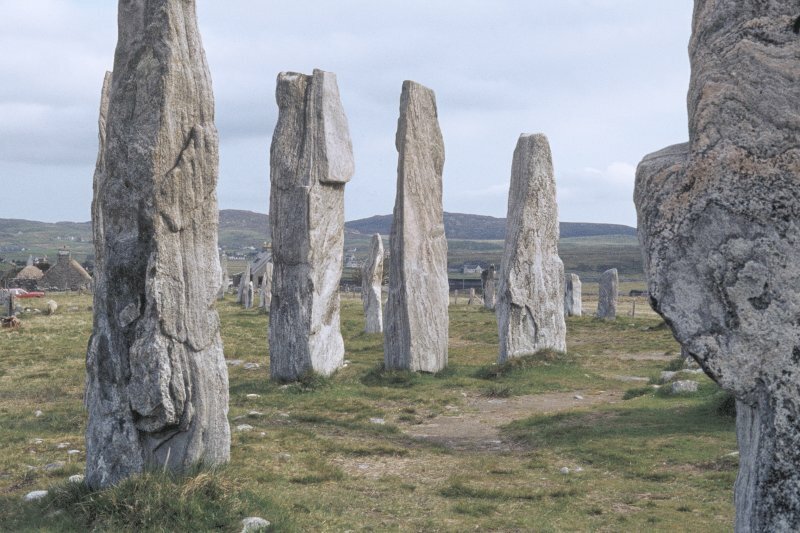 For the tall stone to be seen at true S, 180° of azimuth, one would need to view from the E edge of the nearby road 15m away, when about half of the tall stone and the tips of some circle stones are silhouetted against the sky. It is quite possible that roadworks destroyed other megaliths with only the two or three remaining. 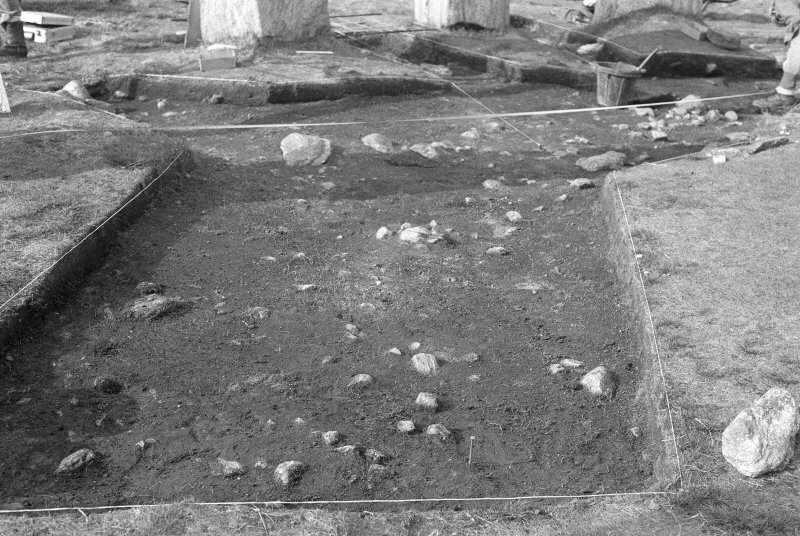 At the time of the S extreme moon, people at site XVl would see the lowest moon passing over site l at a height of c2°, two moon’s widths above the stones. 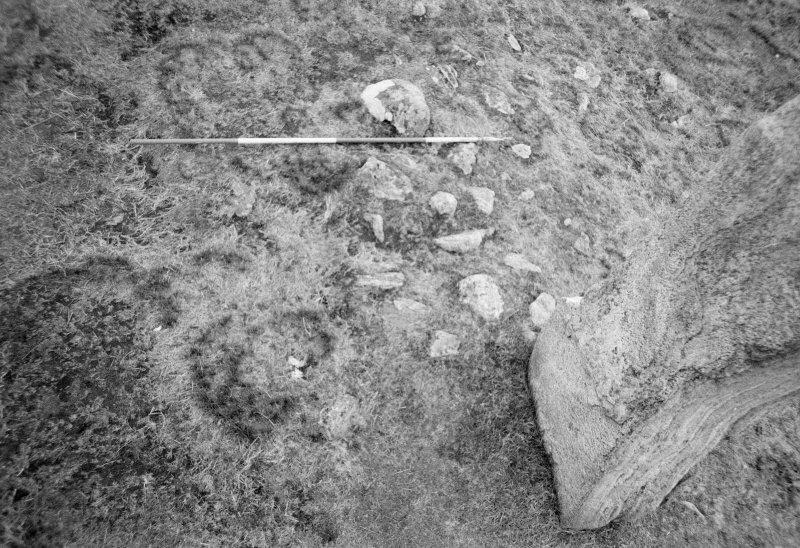 But, at the same time people proceeding in a southerly direction from site XVl to site l, when halfway along the route at its lowest part, would see the moon passing behind the top of the tall stone and skimming some of the circle stones because, from this low point, the top of the tall stone is at a height of 2° degrees ten minutes. The due S position of the S extreme moon is also marked at Callanish Vlll. (DES 2010, 184–5). 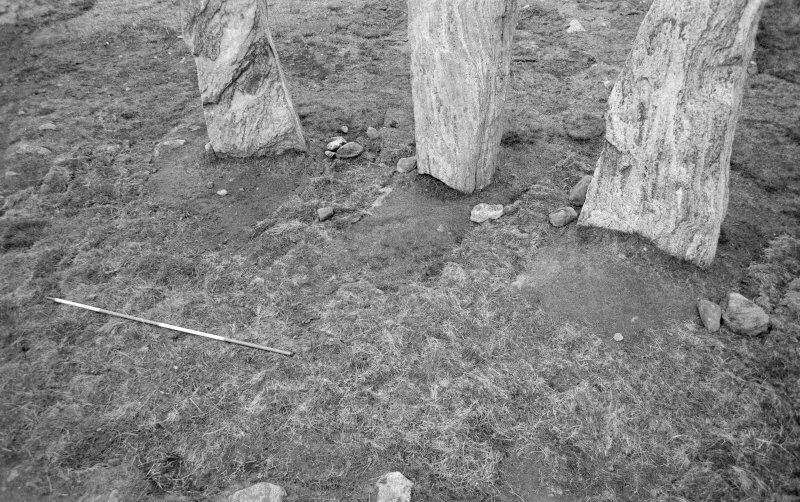 NB 21285 33015 A row of four stones/megaliths, created as a sunrise alignment for the equinoxes, stands to the W of the circle at Callanish l.
Stone 23 The stone furthest from the circle is blocky, whereas the other three slabs are aligned with the row. It is common for the end stone of a row to differ from the others in this way. Stone 22 The stone next to stone 23 is a diamond shaped slab. Stone 21 The next slab is much shorter, but it is not broken. The top is weathered and it has always been the shortest in the row. It now leans a little to the N.
Stone 20 The slab nearest to the circle also leans a little to the N.
Standing alongside stone 23 on the N side, and looking E towards the circle, the flat N face of stone 22, the top of short stone 21, and the S side of stone 20 formed a narrow gap/slit/window when stones 20 and 21 were upright. An observer at the N side of stone 23 would have seen further, through the circle between stone 49 on the left, and stone 45 on the right, to the far horizon where equinoctial sunrises took place. When upright, stone 21 may have hidden stone 49. 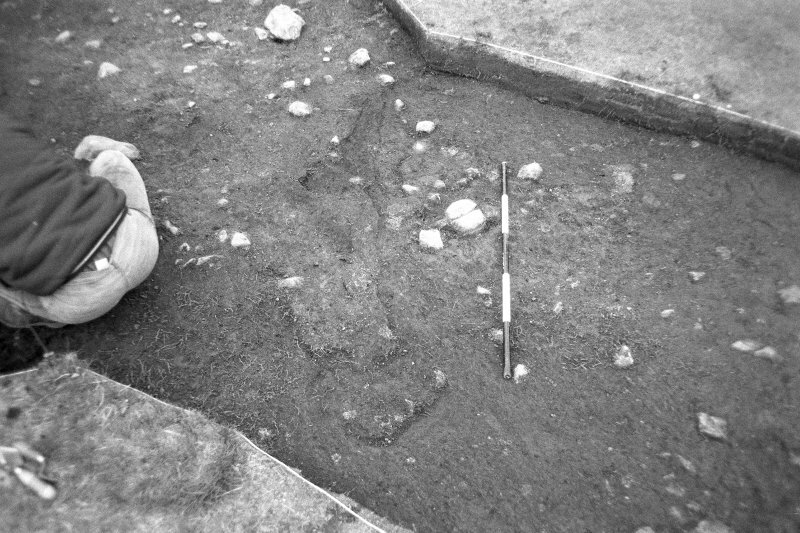 GR Curtis considered that prehistoric observers stood at backsight stones such as stone 23, with the observer’s right shoulder to the stone. 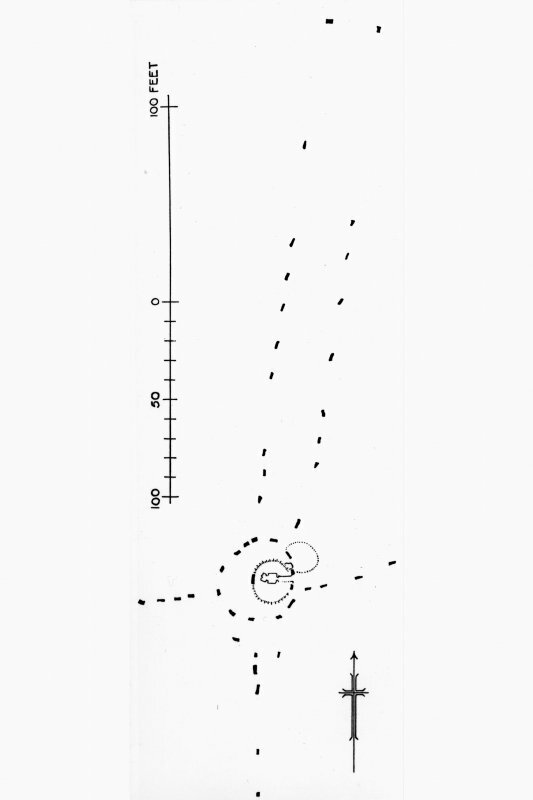 The stone(s) of site 14 lie on the sub–horizon at NB 228329, 1.5km from site l. A reassessment was made of the earthfast stone, which is 0.72m x 0.37m x 0.40m high. There are five small ‘packing stones’ around it. It is possible to probe 0.10 to 0.15m under it in three places. It is not considered to be a standing stone in its own right. 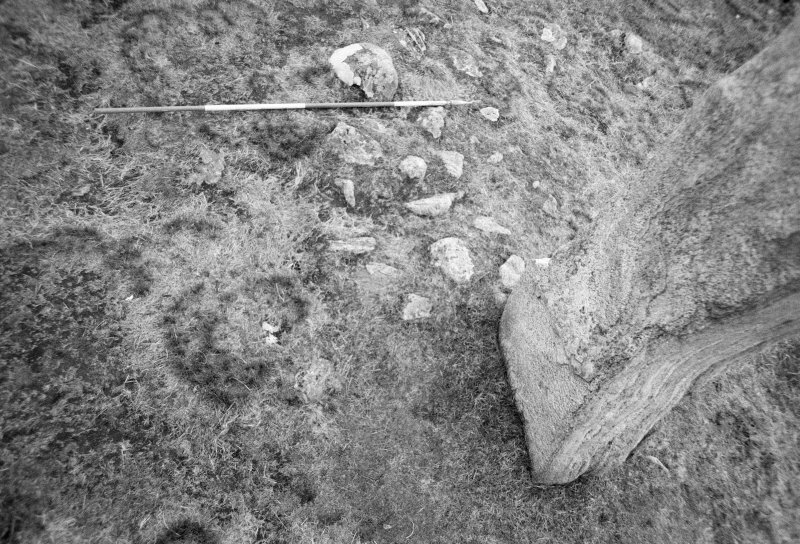 It is just possible that this in situ stone once supported a boulder and was an equinox sunrise marker as seen from site l. The boulder is c1.0 x 1.0 x 1.3m. It has irregular sides and rounded edges and a void underneath. The boulder lies down slope to the S of stone 14, c5m away. 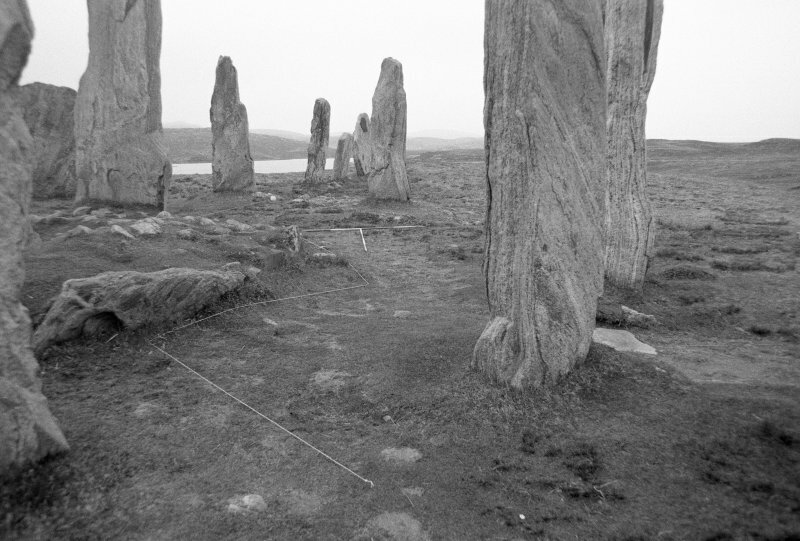 Compare this with the use of two boulders for marking sunrises and lunar S extremes at Callanish XXVlll (DES 2010, 185). At the spring and autumn equinoxes, the positions of sunrises (and sunsets) change most from day to day, c0.7degrees per day. We can see exactly the same sunrises and sunsets as did prehistoric people 5000 years ago at the equinoxes. 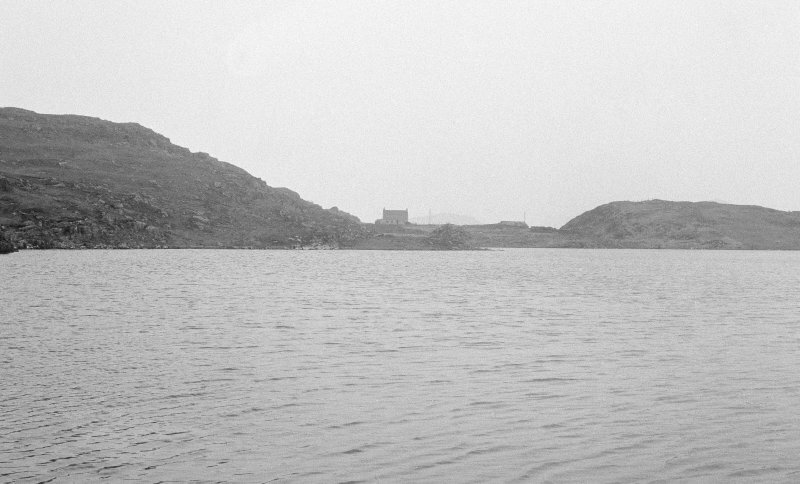 The boulder on the sub-horizon at site 14 may have been used as elsewhere in Britain to differentiate over four years when it was required to insert an extra day, a leap year day, to the calendar. Stone 45 stands in the SE quadrant of the circle. It has been claimed that stone 45 bears the image of a man (the ‘Sun God’?) on its inner face. It has hornblende clusters on its outer face. Stone 45 forms the right hand side of the viewing line from stone 23, through the slit formed from stones 22, 21 and 20, then through the circle. The image of a man can be seen from stone 23 at the W end of the W row. 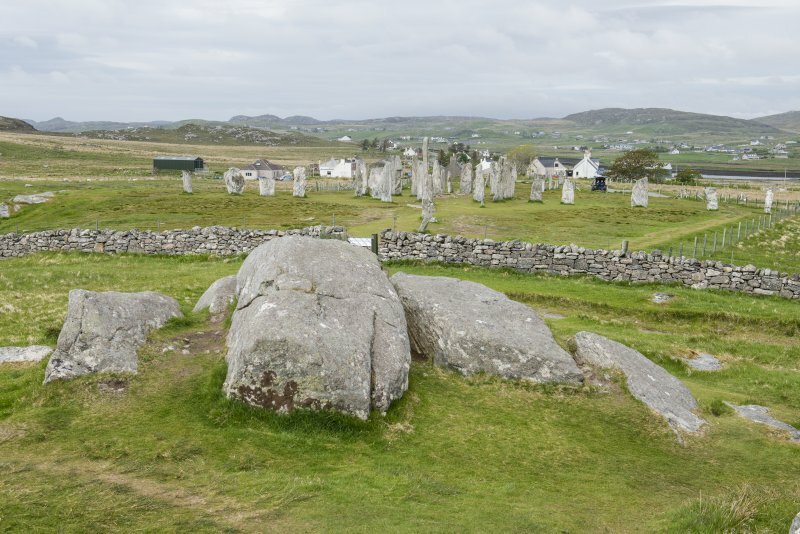 NB 21295 32950 and NB 21300 33017 A natural phenomenon has been observed close to the Callanish I monument which could be significant for the interpretation of the monument as a whole. 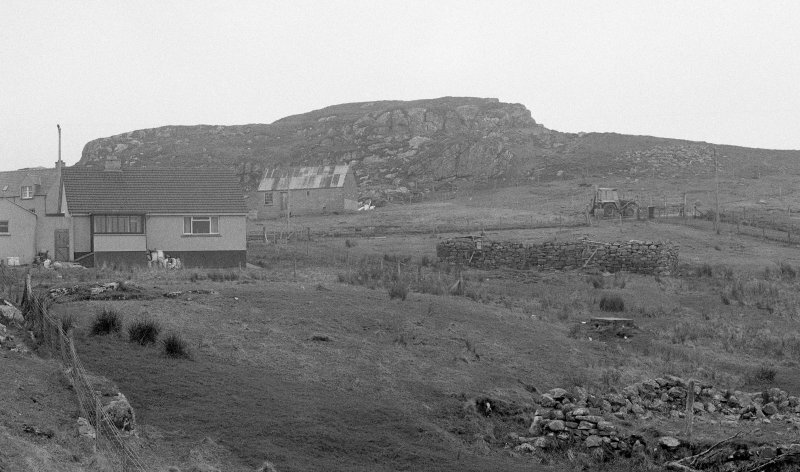 Approximately 20m to the S of the monument lies Cnoc an Tursa, a hillock with distinctive rounded outcrops of bedrock – a Roche Moutonee. One large rounded block sits atop two others on the N side of the Cnoc, nearest the monument. Stones flanking this group create a group of five stones. 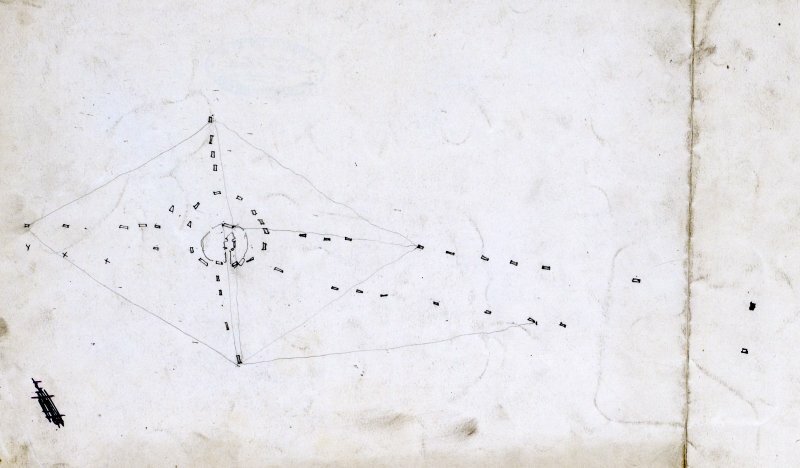 The aperture between the first three forms a small, much discussed cave. 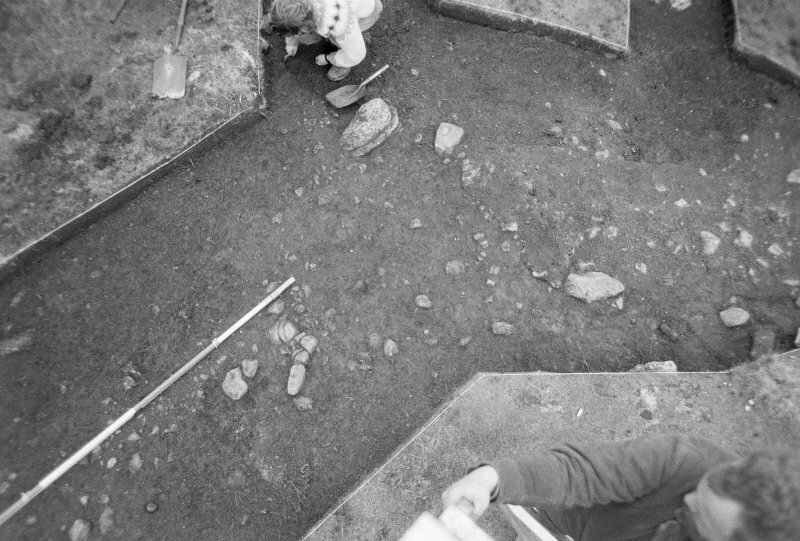 When GM Coles and T Rees excavated trenches immediately N of the cave in 1993–4, they discovered many interesting features including rows of posts, pits and ditches containing pottery and flint. A continuity error in the 1994 DES report creates uncertainty about the position of pits and a ‘wing wall’, which could be on the W, E, or possibly both. It also doesn’t tell us whether the stones left in the cave were replaced exactly or just randomly backfilled. Nevertheless, this area has clearly been the focus of special attention at some point in the life of the monument. Many monuments start life as natural places perceived to be special in some way and it is possible that this cave was such a place. It might also be worth noting the similarity between the cave and its flanking rocks with the entrance and forecourt of a chambered tomb. 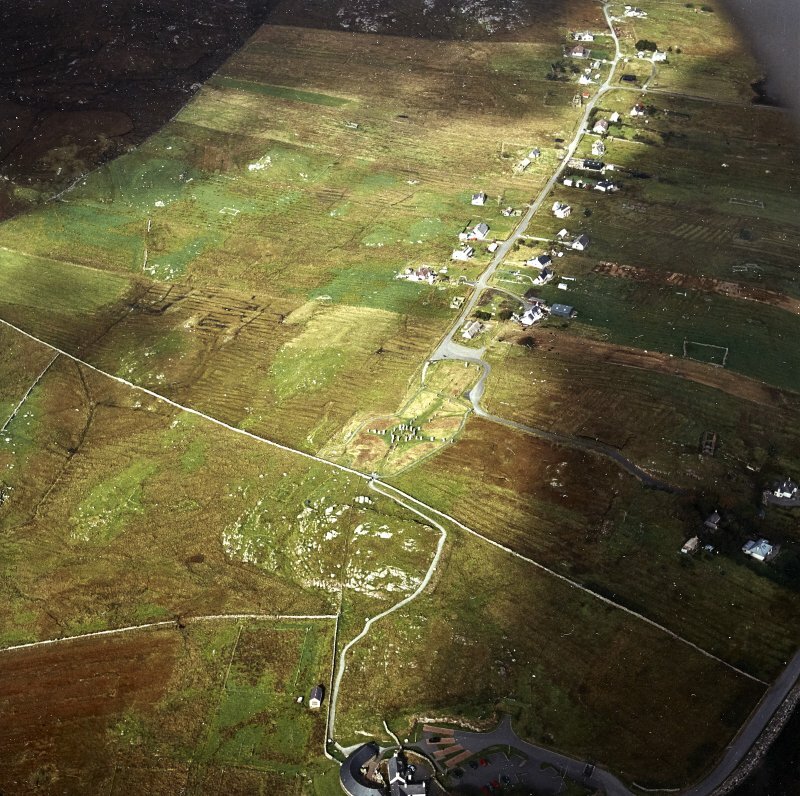 Around midday on a bright sunny day in February, 2013, a defined beam or shaft of light was noticed by Ian Mchardy to be emanating from the back of the cave, around 50 to 150mm wide and stretching 2 or 3m out to the N onto the grass ‘forecourt’. The ‘forecourt’ area around the shaft was in deep shade, intensifying its effectiveness. The potential significance of this beam was realised and the discovery discussed with Margaret Curtis, who has documented it on bright days throughout 2013. 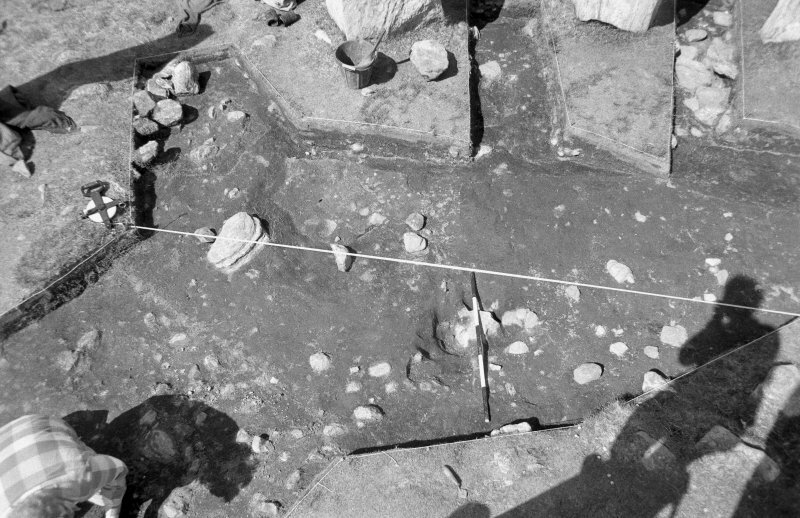 Investigation revealed that the bright sun was shining through a small slit between the rocks, which was further restricted by small trapped chock stones. The shaft moved W to E as the sun moved E to W, not unlike the hand of a clock. It was clear that this could only happen for a limited duration because of the sides of the cave – at around midday, from around 10.50 until 12.30 according to Margaret’s observations to date. Closest to midday the beam shines down directly into the cave, onto a step or seat like stone, as well as out onto the forecourt. Subsequent recording of the beam by Margaret has proved that the length of the beam and the surrounding shadow vary from summer to winter. In summer, the high sun casts a small shadow and beam, and in winter both beam and shadow are long. 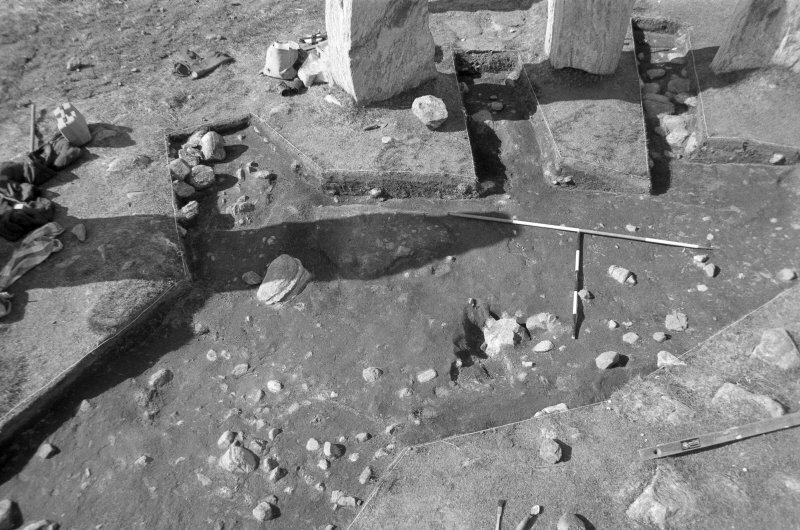 Therefore these stones and the forecourt create a natural sundial, which with the addition of simple markers or posts in the ground at the various beam lengths on a N–S axis could tell not only the midday but the time or even month of the year. Could this have possible in the Neolithic or before? The sun has changed only very slightly in declination since the Neolithic, about the width of their discs over the period since 2000 BC and so slightly more than this since 2,900 BC or before. The difference would mean that the sun and moon were slightly further S in rising and setting, hence only potentially negating the sun dials operation in midwinter, if the sun was so low that the Cnoc an Tursa cast a shadow over the group of five. This seems unlikely given the topography and magnitude of change. 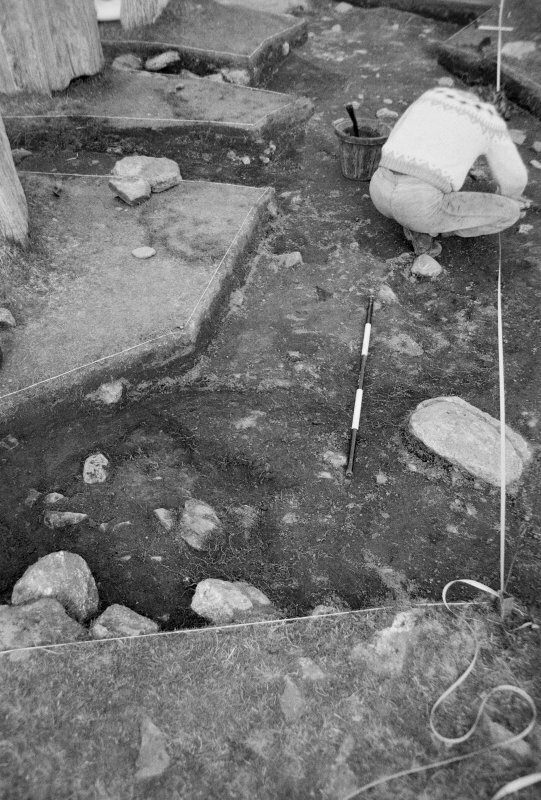 Is this what the lines of pits or postholes found by Coles and Rees were? 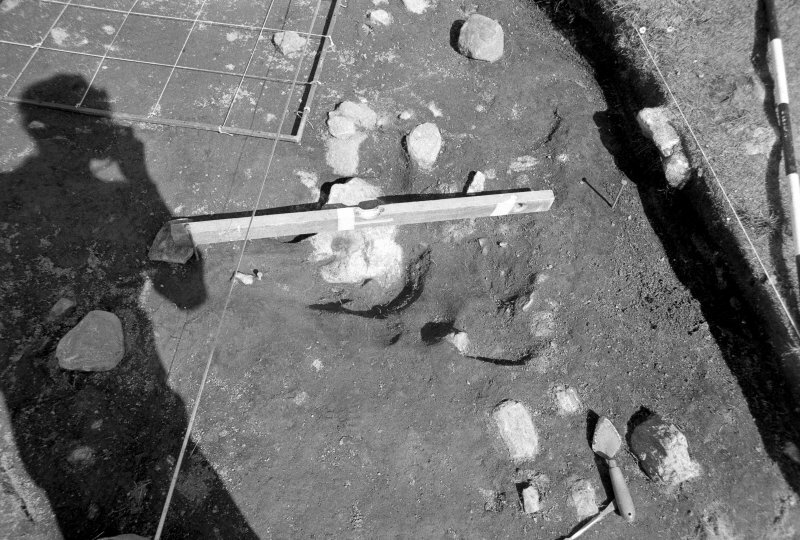 Access to a plan of their excavation may allow us to test this hypothesis, by comparing the excavated features with observation and recording of the actual sun beam through the year. An eight fold yearly division would require five post markers on a N–S line. Twelve months would be easily represented by seven posts, but 12 lunar months would fall just short of the solar year. A division of the year into 13 months would be rather difficult, because 8 posts would represent 14 months. There is also a possibility that on the southern extreme of the moon, a bright full moon’s light could create a ‘moon beam’ allowing the setting to work as a ‘moondial’. Could this have led the builders of Callanish to understand the long, 18.6 year cycle of the moon, as has often been argued to be the case, but yet to be widely accepted? 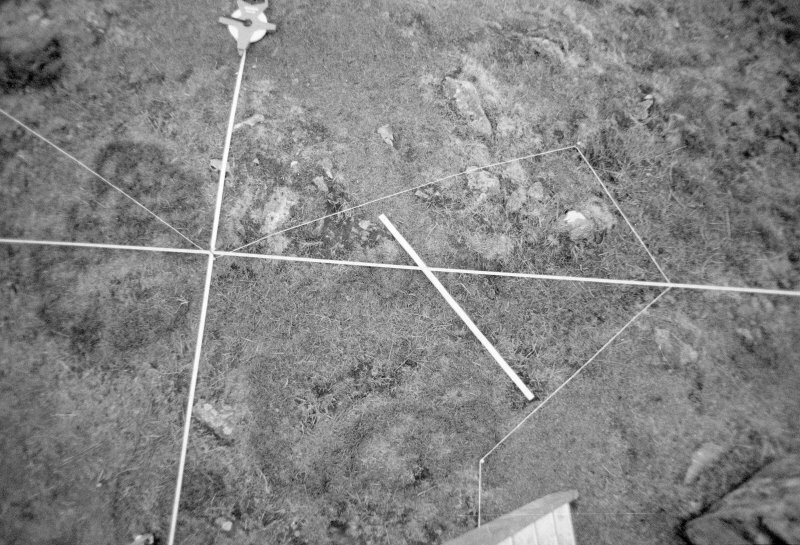 It is hard not to suggest that understanding this natural sun dial would pre-suppose a certain amount of knowledge and lead to a lot more knowledge of the cycles of the heavens. This knowledge would have been extremely useful to a farming population. NB 21297 33024 Two stones, numbers 51 and 52, in the NW of the circle at Callanish l are set close to each other. Stone 51 has an overhang on its inner face and has lost its top since Worsaae drew it in 1846, when it appears to have been the tallest stone of the circle. Stone 52, the adjacent stone to its E, has a ‘shelf’ on its outer face, 2m above the ground. From SW of the circle, the overhang and the ‘shelf’ can be seen to form a rectangular ‘window’ framing a short section of the NE horizon. There is no stone marking the viewing spot. Presumably any such marker has been removed when this area was used for growing crops. At midsummer and midwinter, the rising and setting points of the sun on the horizon vary very little over some two weeks near the solstices. To identify the midsummer’s or midwinter’s day exactly, a precise indication is required - preferably at sunrise - using the first gleam of the sun rather than the tangential full orb of the sun. When prehistoric people used sunsets for identifying the exact date of solstice, they sometimes used locations from which the midwinter or midsummer sun was first seen to set, then briefly re-appear (re-flash) on one day only. Such accurate indicators would last for only a few centuries. The paths of the sun and moon have gradually changed since prehistoric times, making it impossible for us to see the same views as prehistoric people saw at midsummer and midwinter 5000 years ago. The midsummer sun’s path is approximately a suns’ diameter further from N, while the midwinter suns’ path is approximately a sun’s diameter further from S. Only at the equinoxes are our views the same as prehistoric peoples. When an indication is unequivocal and precise, it has been used to date the standing stone monument. 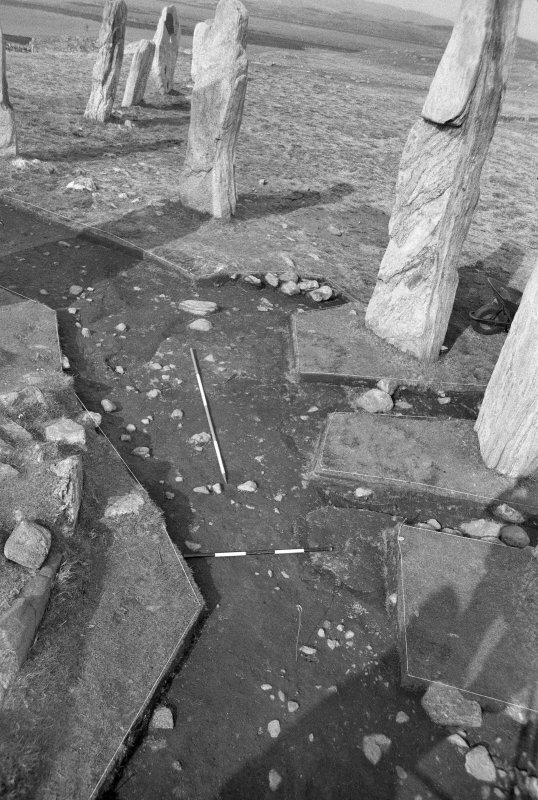 A theodolite survey of the ‘midsummer sunrise window’ showed that in prehistoric times, as sunrise positions moved left/northwards and closer to the midsummer rise position, the sun would have first appeared in the ‘window’ formed by stones 51 and 52 seven days before actual midsummer solstice, enabling people to assemble and hold cerenmonies or rituals on the ‘right’ day. Prehistoric people must have selected the two stones and erected them carefully to achieve such accuracy. 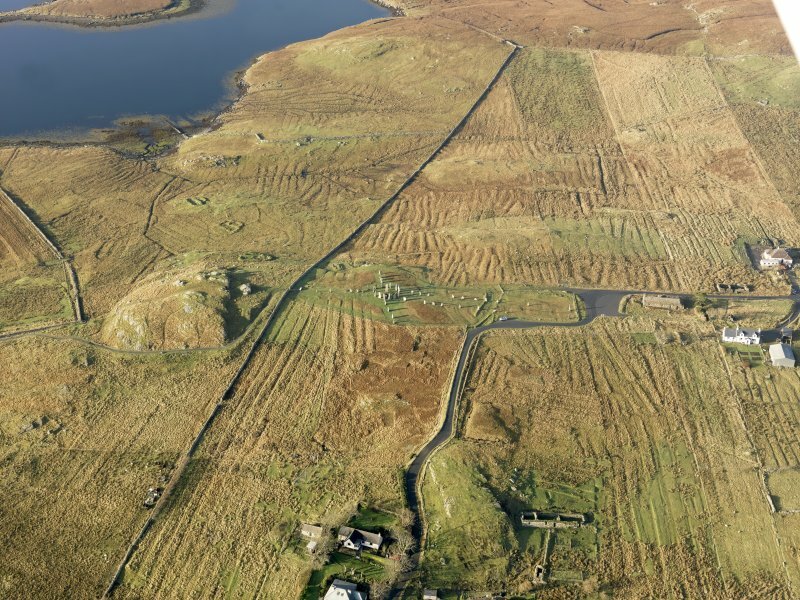 It is not possible to use the ‘window’ in reverse for midwinter sunset due to the topography around Callanish l.
Be on site by 4.15am BST to observe the sun in the ‘midsummer window’. You will not see the actual sunrise from this location as it is behind stones 50 and 51. As the sun climbs into the sky, its light falls on stone 50 creating a ‘sun dagger’ patch of light. 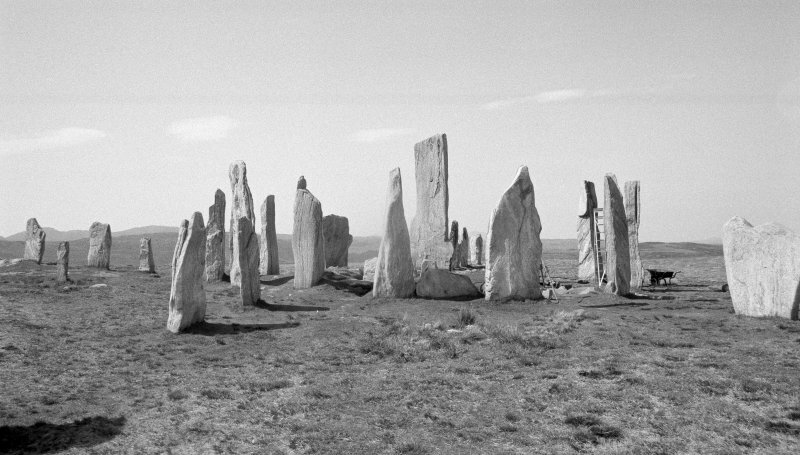 NB 21298 33014 The stones which form Callanish l have not been worked to regular shapes as have those at Stonehenge. The natural irregularities of the stones have been used to help define some solar and lunar events, eg ‘midsummer window’ stones 51 and 52, S extreme moonrise stones 49, 48, 9, 27. The 13 stones of the circle are set at varying intervals around the circle. The gaps between the stones are more important than the stones. 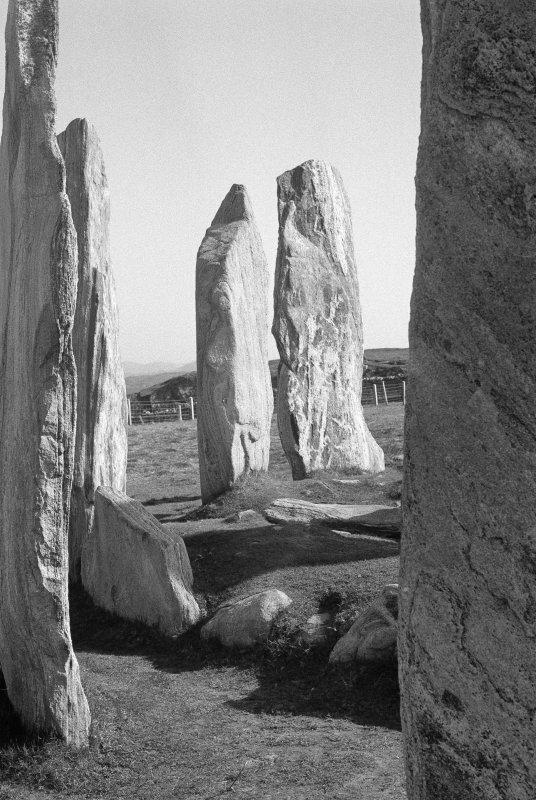 Seen from within the stone circle, the trio of stones 42, 43 and 44 forms a distinct symmetrical setting. 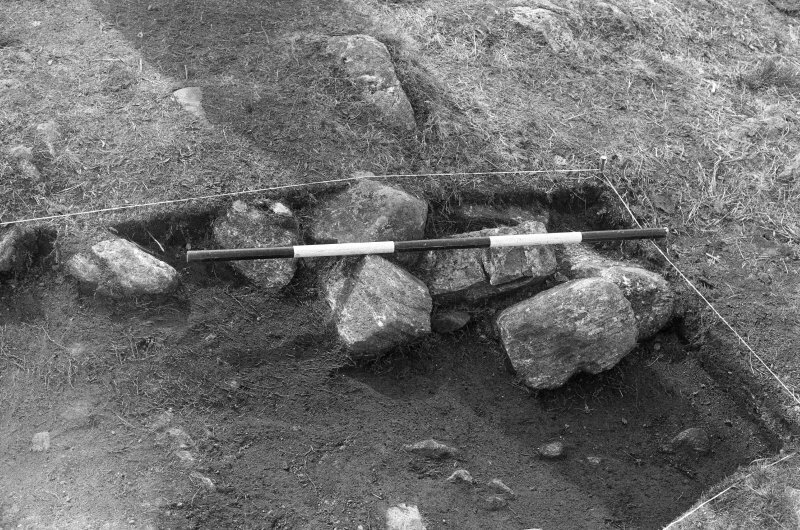 A burial cairn now hides the lower part of all three stones. Their tops are almost level with each other. Stone 43 is a tall isoceles triangular stone, which is set tangentially to the circle and flanked by 42 and 44. Stone 42 to the N of stone 43, is set tangentially to the circle. Its long N edge is slightly irregular and vertical, while the lower two-thirds of the S edge is more or less straight and vertical, the upper third sloping up to the left. Stone 44 to the S of stone 43, is set radially to the circle. Its long S edge is slightly irregular and vertical, while the lower three quarters of the N edge is more or less straight and vertical, the upper quarter sloping up to the right at c45degrees. This is the only stone of the trio 42, 43 and 44 already allotted a function. It marks the E end of the short axis of the flattened circle. The ‘midsummer window’ formed by stones 51 and 52 gave a seven day warning for prehistoric midsummer sunrise. The sun is seen on the horizon. It is not an alignment as such, but is a precise indicator. 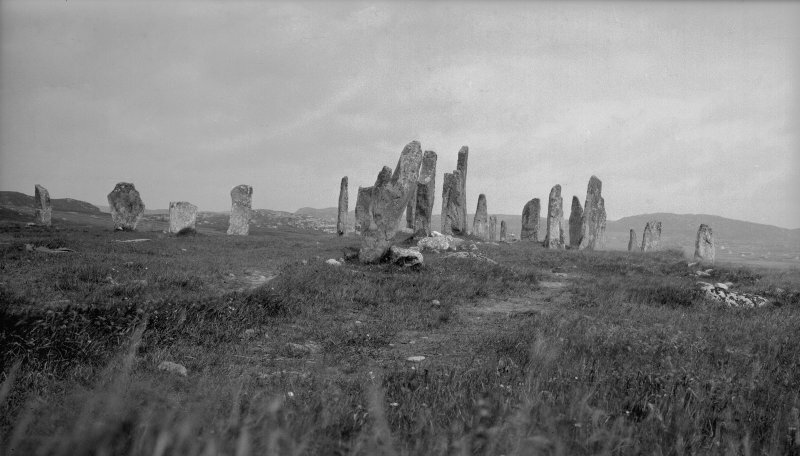 At the Callanish circle, marking the midsummer sunrise position on the E horizon with a circle stone would have required a megalith considerably shorter than the other stones of the circle, or raising the observer’s position. 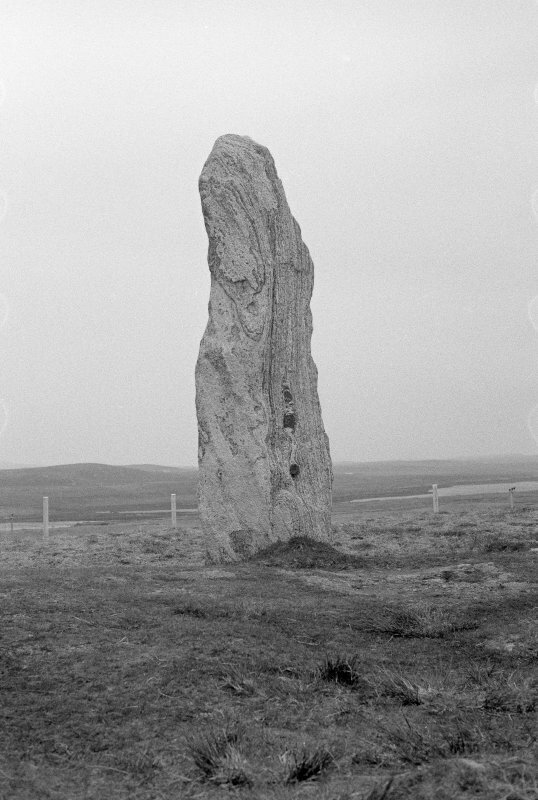 M Maclean in 1987 claimed that stone 9, which stands outside the circle on the SW, was part of a midsummer sunrise alignment. At the time GR Curtis and I misunderstood which stones were involved and disputed his claims as coincidental. A recent chance encounter between M Maclean and M Curtis may have resolved matters. 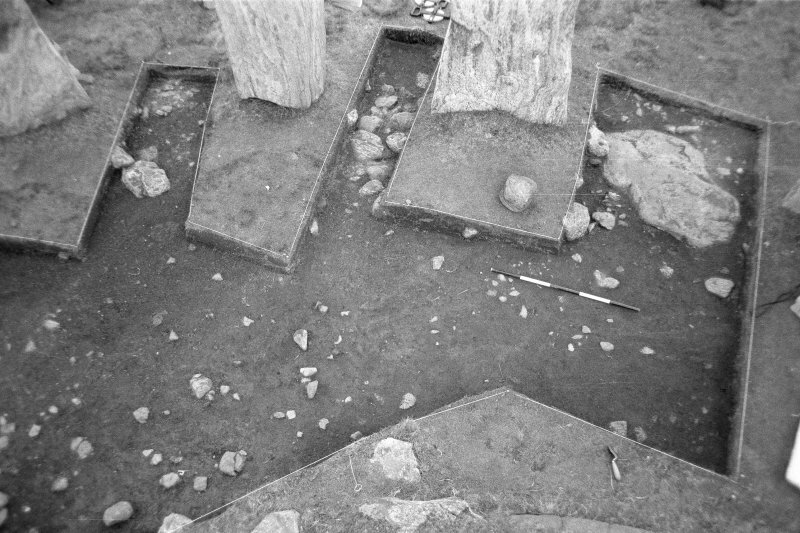 A video taken from ‘the top of stone 9' showed the tops of stones 42, 43 and 44 close to the horizon. 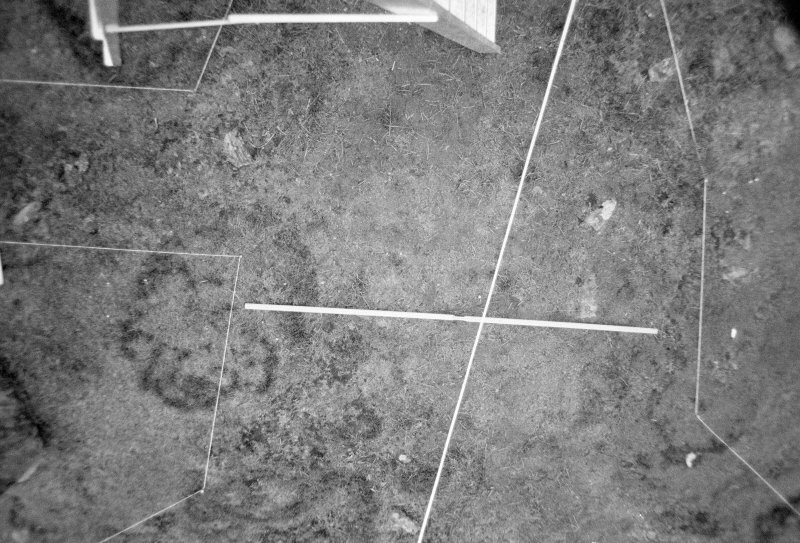 Most of the triangular stone 43 is hidden by the flat top stone 47, but the tip of stone 43 sticks out and marks where the sun rose (first flash or full orb?). 5000 years ago the sun would have risen half a degree (a sun’s width) left/N of its current midsummer rise location. If indeed a line from stone 9 over stone 47 to stone 42 is a deliberate solar alignment, it makes stone 9 a triple backsight, complementing stone 8 at the N end of the avenue with two lunar extremes and the midwinter sun reflash. The ground levels at stones 9 and 42 are similar. Stone 9, c2.75m tall, stands 3.5m outside the circle to the SW. It is not a slab but has three different faces/aspects. The N face has narrow vertical grey and black bands. The E face has irregular grey and black bands on the lowest 1m, but narrow vertical bands above. The SW face is convex and weathered, an original stone surface. Standing with one’s right shoulder at the NW corner of stone 9, the extreme NE moonrise may be seen through the circle and above stone 34. From stone 49, the protuberance on stone 48's N end, the E face of stone 9 and the W side of stone 27, a very narrow slit defines the S extreme moonrise on Sleeping Beauty two weeks away. 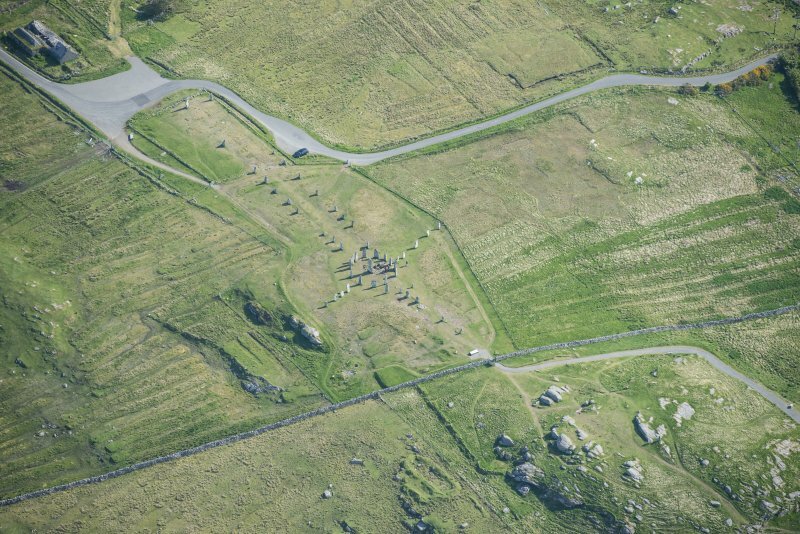 From the top of the convex S and SW face of stone 9, over stone 47 and 42 seem to mark midsummer sunrise. The irregular top of stone 9 was examined for breaks or damage. Stone 47 stands at the S of the circle with its grain set radially to the circle rather than tangentially. It is at the S end of the long axis of the flattened circle, which continues down the avenue, past a group of 13 kerbed and unkerbed stone settings (DES 2011, 191–3) to the multiphase cairn XXlV (DES 1996, 112–3; 1997, 86; 1999, 94; 2011,191–4). Standing with one’s right shoulder to the W side of stone 47, or with one’s back to the N side of it, one can see over the constructional centre of the circle all down the route to cairn XXlV about 1.8km away. A full examination of stone 9 and the NE view from the top raised some queries. It is not possible to see over the top of stone 47 and keep the tops of stones 42, 43 and 44 more or less at horizon level. A higher view drops the three stones below the horizon. If triangular stone 43 has lost its very top and used to be taller, these problems would be resolved. No records show it as taller than now. How did people use this putative midsummer alignment? Did they simply climb stone 9, or use ladders? If there was a platform on top of stone 9, the person standing on it would be lit up by sunlight shortly before the sun rose above the horizon. 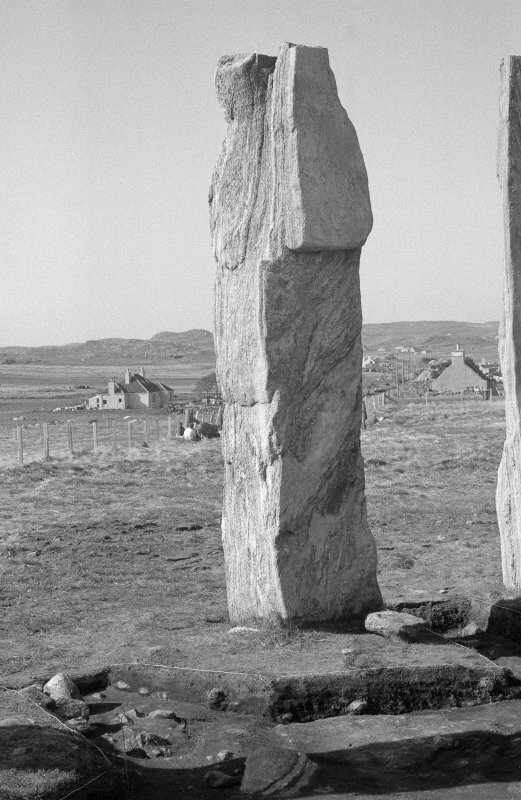 Might this be the origin of the legend of ‘The Shining One’ at midsummer at Callanish? Alternatively a person on stone 47 could be lit in the same way and move NNE along the avenue. The top of stone 9 has only one smooth and weathered edge running roughly NS, and a number of angular edges and facets on the E side which indicate that chunks have been broken off. Standing stones in the vicinity of stone 9 all show damage. We assume damage to stone 9 as having taken place in the early 19th century, and that it once stood taller. The rising midsummer sun would have shone over stones 42 and 47 and first lit the top of stone 9. A person on top of stone 9 would see the first flash of the midsummer sun slightly before people at ground level. A watching brief was carried out on 11 March 2015, during the excavation of five small holes to allow the installation of survey markers. The location of each hole was chosen to fall within areas known to have been disturbed in previous archaeological excavations. None of the holes required the removal of turf beyond a depth of 140mm. 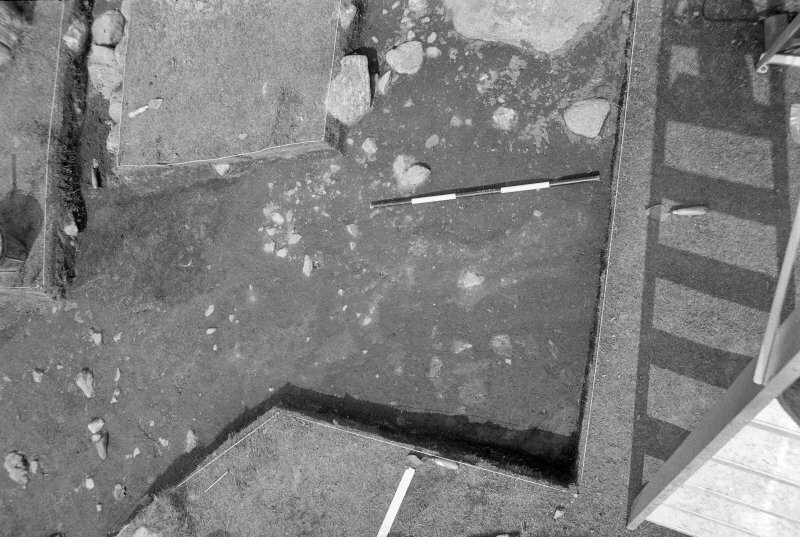 The initial excavation of one of the holes revealed angular fragments of granite, and although it was thought almost certain that these stones were remnants of spoil or backfilled trenches from earlier works, a stonefree, adjacent position was found for that marker to avoid potential damage.